Building standard lociomotives and rolling stock should lower costs: considers transfer of such construction from the railway companies to the contract suppliers who would gain through scale aqnd increase their overseas competiveness. The first five of 17 A4 Pacific locomotives under construction at Doncaster were about to be placed in service. In view of their streamlined form it has been decided to name them after birds and the first five will be numbered from 4482 onward and called Golden Eagle, Falcon, Merlin, Kingfisher, Kestrel, thus associating them with the most graceful form.of speed and movementthat of the flight of birds. On January 6 No. 4482 Golden Eagle worked the 13.20 train out of King's Cross as far as Newcastle. This was one of the heaviest trains of the day, the gross load being never less than 500 tons. The new 2-6-0 locomotive now under construction at Darlington for service on the West Highland line is to be named Loch Long, and No. 3441 has been allocated to it. It is to be classified K4 and will have three cylinders 181 in. by 26 in. as in the K3 class, but will have 5 ft. 3 in. instead of 5 ft. 8 in. coupled wheels, and a modified boiler. New 2-6-0 mixed traffic locos. of the K3 class, up to No. 3824 had been completed at the Darlington Works ; Nos. 3818, 3819, 3820 and 3821 were allocated to the Southern area ; Nos. 3822 and 3824 were at York and No. 3823 at Heaton Junction. No. 190, the 2-2-4 tank engine used for inspection work by the engineer, had been withdrawn; it was built at York in 1881. During 1935, engineers of the Northern Railway of France performed experiments in the wind-tunnel designed by Lelarge, of the Auto-technical Institute of St. Cyr, with a one-tenth scale model of one of their Pacific type locomotives, Series 3.1251 to 3.1290. As a result it was decided to proceed with the streamlining of one of these engines, No. 3.1280, in collaboration with the Societe Anonyme l'Aerodynamique Industrielle. Supplied by Kisha Seizo Kaisha Ltd of Osaka. 3ft 6in gauge. Many welded components. 28 J39 0-6-0 supplied by Beyer Peacock & Co. Ltd with welded tender tanks. Constructed by Ateliers de Construction du Nord de la France et des Mueeaux at the Blanc Misseron Works for Southern Railway London to Paris service. Supplied Rheinische Metallwaaren and Maschinenfabrik of Dusseldorf to specification and inspection of Robert White & Partners. Metropolitan Vickers Electrical Co. Ltd. 11. A.W. Harty design constructed at Inchicore Works for Dublin & South Eastern Section: open plan third class and side corridor compartments for first class: livery crimson lake. Manufactured by Gresham & Craven Ltd and fitted to 25 coaches supplied to Canton-Hankow Railway below. Birmingham Carriage & Wagon Co. Ltd. was builder. During December the last five of the final order for 4-6-0 3-cylinder passenger engines were completed and turned out at Crewe, as follows : Nos. 5738 Samson, 5739 Ulster, 5740 Munster, 5741 Leinster, and 5742 Connaught. Of these No. 5740 is fitted with one of the smaller 3,500 gallon tenders ex "Royal Scot" class, the other four engines being provided with standard 4,000 gallon tenders. The first of the new series of 2-8-0 freight engines was also turned out at Crewe in December, No. 8017. Another of the "Silver Jubilees" has recently been named at Crewe, No. 5611 Hong Kong. Two further 4-6-2 passenger engines of "The Princess Royal" class have been fitted with new enlarged tenders, Nos. 6204 and 6207. No. 9136 has been converted from class G to class G1 (superheater) and is now provided with a standard Belpaire boiler. Engines rebuilt recently with Belpaire boilers include class G1 Nos. 9187 and 9344; also 18 in. goods class Nos. 8597 and 8616. The latest 2-cylinder 4-6-0 ex Armstrong, Whitworths is No. 5298. Of this series, Nos. 5260-89 are now in service on the Midland Division, while No. 5290 and upwards are presumed to be for the Western Division. Recent withdrawals include ex N.S.R. 0-6-0 "D" tank No. 1576; also the following ex L.N.W.R. engines : 4-6-2 superheater tank No. 6988; 4-4-0 "George V" class Nos. 25223, 5295, and 5359; 4-6-0 "Prince of Wales" class Nos. 25672, 25730 and 25812. Broadstone terminus, Dublin, the former station of the Midland Great Western Railway, to be closed and the traffic diverted to Westland Row station, a new loop line having been constructed from Liffey Junction to Westland Row for the new service. Broadstone station premises will be used as an omnibus station. The locomotive sheds at Broadstone will still be used. Strenuous conditions of loading and unloading met with in cement works and quarries, the ordinary type of wood dump wagon is often unable to stand up to the shocks when material is dropped from a height. A robust design of all-steel tippler wagon, taking a load of 20 tons, is illustrated. This had been built to the standard gauge with a capacity of 450 cubic feet, but does not conform exactly to the Railway Clearing House specification, as the wagons are intended more for private works use. It will be noticed that the wagon illustrated is fitted with a two-wheel brake only, but many have been built with four-wheel brakes. The wagon is composed of two separate unitsbody and frame. The contents of the body have to be dumped by power, usually by a crane; there are no doors. The entire body is strongly sup-ported by channel-section beams and it will be noticed that the top beams afford additional support and are prolonged to facilitate the discharge operations. The makers of these wagons, Marshall, Sons. and Company (Successors) Ltd., of Britannia Ironworks, Gainsborough, have extensive facilities for producing steel wagons of various kinds for different purposes and have recently supplied a number of the tippler wagons to various cement works. Order received from the Bengal North Western Railway Co. for six 2-6-2 tank locomotives, metre gauge, to the inspection of Messrs. Rendel, Palmer and Tritton. Albert Street terminus, of the former Cork, Blackrock and Passage Railway sold to Metal Products Ltd. and is to be used as a factory. The Instiution of Locomotive Engineers, History of the steam tram. 23-6. Meeting held on January 6 at the Hall of the Institution of Mechanical Engineers, a paper entitled "History of the Steam Tram," was read by Dr. H. A. Whitcombe. A long precis was published and this has been incorporated into the entry for Paper No. 368. Repair of fireboxes has improved via developments from welding copper in other industries; notably via the use of copper lithium alloy or copper silver alloy for the welding rods..
Three types: four-wheel, six-wheel and bogie vans with ice bunkers built at Wolverton for Palethorpe's of Dudley Port who manufactured sausages. Re W. B. Thompson's American Notes in November number. They have the added value of being based on first-hand observation by a gentle-man ho views American railways with an unprejudiced eye. I trust that he will pardon me if I venture to offer a few comments to supplement his notes. First; it might be mentioned that brakesmen and switch-men (or shunters) still pass along the tops of freight cars while in motion. The work is extremely hazardous, but they become accustomed to it and generally live to a ripe old age. Thompson describes air-conditioning as "still in the experimental stage." In a sense, that is correct. Several radically different systems of cooling and purifying the air in passenger carriages are now in extensive use. So long as the apparatus is in perfect working order and is correctly manipulated, all these systems provide satisfactory air-con-ditioning. But there is no denying that some arrangements develop more defects and are more troublesome than others. From the data accumulated so far, it is not yet possible to say definitely just what the final standard form of air-con-ditioning apparatus will be. On December 31, 1935, there were 5,867 air-conditioned passenger carriages on American railways ; 3,233 of these were the property of the Pullman Company. During the year 1936 a further large increase in this number has been made, which indicates beyond doubt that air-conditioning is here to stay. The impending demise of the ultra-large locomotive has often been forecast, but the present writer sees little prospect that the "big engine may eventually go out of fashion." The American long-distance traveller has become so accustomed to the comfort and safety provided by the standard heavy passenger-train equipment that he will not be satisfied with anything even slightly inferior. Special steels and improved designing will undoubtedly effect considerable reductions in weight of future carriages, but this will soon be offset by an increased number of cars per train and a higher running speed. Long trains and high speeds require heavy and extremely powerful locomotives. Many of this year's orders call for engines even larger than those built for the same railways in the past. A list, probably not quite com-plete of 325 steam locomotives ordered from American makers between January 1 and December 1, 1936, shows that more than 75 per cent. of these locomotives are of such size and power as to demonstrate conclusively that the trend is still upward. What the ultimate limit of size may be, it is impossible to predict. Recent development of high-speed streamlined Diesel-electric trains clearly illustrates the fact that featherweight trains of restricted cross-sectional area are not suited to long-distance travel in America. The first Union Pacific stream-lined train was described in the LOCOMOTIVE for March 1934. That train was nine feet wide and ten feet two and one-half inches high. The average weight per foot run was 980 lb. Since that time the same railway has received five additional trains of similar construction, but the width has been gradually increased to nine feet, ten inches and the height to fourteen feet. In the two latest twelve-car trains, placed in ser-vice on June 18, 1936, the average weight per foot run is raised to 1,540 pounds, which is an increase of 57% over the first train. On December 1, the Southern Pacific-Union Pacific-Chicago and North Western announced an order for two new Diesel-electric trains, to cost about .£300,000 each. These trains, like the preceding two, will be only partially articulated and will consist of 17 car bodies, including a three-unit power plant. They will replace shorter trains now being used on the Chicago-Union Pacific Coast route. The power plant will have the unprecedented total capacity of 5,400 H.P., as compared with 2,400 H.P. on the 12-car trains, which would indicate a further considerable increase in weight per unit of length, and probably also a greater cross-sectional area. In spite of the apparent success of Diesel-electric traction on the Union Pacific and the Chicago, Burlington and Quincy, all of the American locomotive builders profess renewed confidence in the ability of the steam locomotive to meet any requirement. An order for 17 streamlined high-speed steam locomotives, placed with the Baldwin Works by the Atchison, Topeka and Santa Fe Railway on December 1 is of especial significance in view of Santa Fe's experience with a 3,600 H.P. double-unit Diesel-electric locomotive. This latter locomotive, which caught fire once and suffered a broken axle on another occasion, is evidently not considered the answer to the high-speed problem. Six of the new Santa Fe locomotives will be of the 4-6-4 type, with 7 ft. coupled wheels. They will be used on continuous runs from Chicago to La Junta, Colorado, a distance of 990 miles. The other eleven engines will be of the 4-8-4 type, with 6 ft. 8 in. coupled wheels, and will run without change from La Junta to Los Angeles, California, a distance of 1,236 miles. All engines will have nickel-steel boilers and will be oil-burners. They will have roller-bearings on all axles. In addition to the passenger engines, ten 2-10-4 type freight locomotives, similar to No. 5000 as illustrated in the LOCOMOTIVE for February 1933, have also been ordered. Four-cylinder '4-6-0 express engine, No. 6028, had been re-named King George VI. New engines completed at Swindon Works:Nos. 3711-4, 0-6-0 tanks; Nos. 4116-19, 2-6-2 tanks; No. 6810 Blakemere Grange, 6811 Cranbourne Grange, and 6812 Chesford Grange, 4-6-0 tender engines; and No. 3206 Earl of Plymouth, 4-4-0 tender engine. Recent withdrawals from stock included: No. 230 (Barry Railway No. 30) 0-6-2 tank; 720 (Barry Ry. No. 100) 0-6-0 tank; 1647, 1908, 1976, 0-6-0 tanks; 1468, 0-4-2 tank; 3274 and 3410 Columbia 4-4-0 tender ; 4335, 4346, 4357, 4376, 2-6-0 tender. The G.W.R. announced their intention of establishing, at Caerphilly, shops for all repair and painting work for the carriage stock in that area. Fifty coaches at a time can be dealt with. Storage sheds to accommodate more than 100 coaches were to be erected also at Cherry Orchard between Caerphilly and Cardiff. These sheds are to be used to house the reconditioned stock after passing through the new repair shops at Caerphilly. Seven roads are to be provided and the sheds will be 100 ft. in width. Mechanical World Year Book, 1937. London: Emmott and Co. Ltd., 28 Bedford Street, or Manchester, 31 King Street West. This appears in its fiftieth annual edition and contains several fresh features. These include, for example, an entirely new article on toothed gearing of every kind. The increased speeds which have been introduced into practi-cally every kind of machinery have necessarily been accompanied, and partly made possible, by great advances in the design and manufacture of toothed gearing, and consequently up-to-date information on the subject is required. Other sections have been revised to conform to recent developments and to include newly ascertained data and a number of useful tables. As an invaluable book of reference for all practical engineers this year's edition is in our opinion even more useful than those which have preceded it. Agenda Dunod 1937 "Chemins de Fer.Paris: S. R. L. Dunod, 92 Rue Bonaparte, 6e. The fifty-sixth edition of this very useful work of reference covers practically all branches of French railway practice. Chapters are included on permanent way, materials used, railway operation and train working. In the section on traction the resistance of trains, locomotive efficiency, auto rail cars, electric traction and ferry-boats are dealt with. The rolling stock section includes different types of passenger vehicles, goods wagons, brakes, lighting and heating the vehicles. The latest methods of signalling on the French railways are included. New sections deal with sleepers for the permanent way in wood, steel, and reinforced concrete, as well as a composite of steel and wood. Introduced a procedure for informing its customers of any developments or improvements to their existing designs of superheater equipment. Data will be sent, as occasion demands, in the form of "Information letters." The first of the series is to hand and relates to improvements found necessary to the design of the Element Clamp Washer and Element Bolt Nut. By this means it is hoped the letters will enable some of the technical and prac-tical queries which may be raised from time to time to be satisfactorily answered. New edition of their Section "B" catalogue, dealing with Model Stationary Engines, Boilers, Finished Fittings, Castings, Drawings and parts. The many items include a working Traction Engine of which either the finished model or castings and working drawings are supplied. There are a number of new small locomotive fittings, including a vacuum brake ejector, and there are many locomotive, carriage and wagon wheels supplied, either as castings or finished. A section is devoted to outline drawings for gauge "0" and gauge 1 locomotives and rolling stock of all companies. Booklet of 28 pages published by the Great Western Railway entitled Exceptional Loads, gives illustrations and diagrams of the various wagons specially constructed for unusual traffic. These "outsizes" in railway freights include 62 ft. long naval guns, 108 tons in weight ; 84 ft. long girders ; 73 ton stators ; 131 ft. square ship's propeller; motor boats; big "buoys" for the Navy; steam rollers and tractors. Wagons capable of carrying up to 120 tons in weight, and to take unusual and awkward shapes are included. London-Glasgow in 6½ hours. 65-6. Announcement of Coronation Scot (although neither name of train nor locomotive class) schedule departing London and Glasgow at 13.30 to start on 5 July 1937. Diesel-electric motor coaches, Northern Railway of France. 69-70. R.B. Fellows. William James, railway engineer. 73-6. Institution of Locomotive Engineers. Retardation of trains. 76-8. Anouncement of new express to be known as the East Anglian to perform the tedious journey between Norwich and London in two hours 15 minutes. New rolling stock to be provided (NB current privatized railway) with streamlined Sandringham class locomotives. R. Pattison had been on the staff of Mertz and Maclellan for twenty years [in 1937] when appointed by the LNER as an assistant for overhead equipment on its electric traction staff. Previous experience included the suburban electrification of the Victorian Railways at Melbourne, the South African Railways in Natal and the Great Indian Peninsular Railway at Bombay. During the week ending 6 March 1937 the L.N.E.R. had a demonstration of rolling stock at the Alexandra Palace Station sidings. By arrangement with the British Broadcasting Corporation a broadcast for both sound and vision reception was given on Saturday, 6 March, at 3 p.m. This television broadcast is likely to be the fore-runner of many instructional items on railway work, and should be of considerable publicity value. The last journey on the Bishops Castle Railway, which has now been demolished, was made on Sunday morning, 28 February 1937, by the old 0-6-0 engine, Carlisle, which worked the remainder of the rolling stock into the goods yard at Craven Arms from the junction with the L.M.S. and G.W. line. The engine itself has now been cut up, and the name plates presented to the driver and fireman and the whistle to the engineer in charge of the work of demolition. It is estimated the amount of scrap metal from the railway exceeds 2,500 tons. The train left Bishops Castle Junction to the accompaniment of a volley of fog signals. An illustrated history of this railway by T.R. Perkins appeared in Locomotive Mag. issues of November and December 1930. The engine Carlisle was built in 1868 by Kitson & Co.
Reference (on page 361) in your November issue, to some productions of the old locomotive-building firm of Hawthorn's of Leith raises some interesting considerations as the locomotives constructed by that particular firm seem to be almost unknown, although there was apparently a fairly considerable quantity turned out by them. Your article mentions Hawthorn's No. 190 of 1858. I also have records of engines built by them for Chile as follows: Nos. 386-91 of 1868, 395-400 of 1869 and 425 of 1872, but there had been at least ten previous engines built by the firm for Chile, five in 1854-5 and five in 1856 of which the makers' numbers are unknown to. me. There were a number of locomotives built for Chile during the years 1854-1868 by R. and W. Hawthorn of Newcastle, but there were others merely called "Hawthorns" which it appears probable may have been by the Leith firm. You mention that the firm came into existence about 1851 but it is on record that some engines built for the North British Railway (Hawick Branch) as early as 1846-50 came from Leith, also in 1852 the Leith firm constructed some further engines ordered from R. and W. Hawthorn, Newcastle, and were thus in those years closely connected with the latter. From the firm's construction numbers having reached 426 in 1872 it is evident that the 'sequence of such numbers was not limited to locomotives but included other productions. It would appear to the writer to be worth while for any other engineers having knowledge of the early locomotive stock of railways abroad, who may have had locomotives by Hawthorns of Leith, to furnish any information they may have in order, if possible, to form some general idea of the Leith firm's contribution to locomotive development. Engines of the 4-6-0 type completed at Swindon during January were Nos. 6820 Kingstone Grange, 6821 Leaton Grange, 6822 Manton Grange, 6823 Oakley Grange, 6824 Ashley Grange. Also 0-6-0 tanks Nos. 3715-7, and 7417-9. Withdrawals from stock include the following 0-6-0 tanks, Nos. 754 (Barry 133), 1505 and 1771; 4-4-0 tender engines, Nos. 3277 Isle of Tresco, 3285 Katerfelto, 3392 New Zealand, 3403 Trinidad; 2-6-0 tender engines, Nos. 4327, 4347, 4370, 4374 and 4378. Received order for a Diesel locomotive for the Jokai Assam Tea Co. identical with one previously shipped some 18 months ago. It has also received an order for a Diesel locomotive for the Cornwall County Council and another from the War Office for a Diesel rail coach of standard gauge for service on the new ranges at Shoeburyness. To build two 2 ft. 6 in. gauge 0-6-2 tender locomotives for the Bombay, Baroda and C.I. Railway, to the inspection of Rendel, Palmer and Tritton. Orders for two Ajax steam-operated fire-doors for locomotives for the Bengal Nagpur Railway now under construction at the Darlington Works of Robert Stephenson & Co. Ltd., and also for two Ajax air-operated fire-doors for two boilers for the Canton-Hankow Railway now in hand at the same works. The same firm has also received orders for 36 Ajax grease lubricators for Nanoya class locomotives of the Ceylon Government Rys., also 106 similar lubricators for the new 4-4-0 type locomotives for the Egyptian State Railway now in hand at the North British Loco. Co.'s Works. Materials Handling PlantPublication, No. F. & C. 7853. 44-page brochure illustrates the activities of the Fraser and Chalmers Engineering Works (Proprietors, The General Electric Co. Ltd.) in materials handling installations. Among the plants shown are examples relating to the hand-ling of coal, coke, ore, gravel, sand, cement, crates and cargo of every description, sugar, bananas, motor car parts, etc. In conjunction with the Robins Conveying Belt Co. the Erith Works have designed, manufactured and installed complete equipments for the most widely differing materials in all types of industrial undertakings during the last 40 years. Twelve 4-8-2 type locomotives building by Henschel & Son for the South African Railways are to be fitted with Timken roller bearing axleboxes for the leading bogies, hind trucks and tenders. Issued by the Copper Development Association, Thames House, Millbank, S.W.1, the latest publication entitled "Brass Pressings," deals with the design and use of the many products which are now cold-formed from strip and sheet metal. In its 68 pages in addition to describing quite a number of the wide range of products obtained from copper alloy strip and sheet material, a general account is given of the types and properties of these alloys. Copies will be sent to readers on application. Re-boilered "Lord Nelson" class engine, Southern Railway. 100. illustration, diagram (side & front elevations), table. Eleven ten coach trains for excursion traffic (NB Abellio you mean Dutch company) to be constructed at Derby Carriage Works with seats for 511 third class and 18 first class wwith a weight saving of 55 tons due to articulation. Also 33 non-corridor arranged as three coach articulated sets. J. Clayton presented "The modern locomotives of the Southern Railway" to members of the Railway Club at the Royal Scottish Corporation Hall on 11 March 1937. He mentioned the standard features embodied in all the designs and the many restrictions on size and weight. Institution of Locomotive Engineers. The lining up of locomotive frames, cylinders and axleboxes. 118-19. Order placed with Vulcan Foundry for four XU class and four XV class for East Indian Railway; and four XL class and four XW class for the North Western Railway. The Eastern & Northern Railway which had adopted a 5ft gauge contributed the following singles to the ECR: the gauge was changed at the Romford Works. For Liverpool Exchange to Southport services: 59 motor cars and 93 trailers. 66ft 6in long and 9ft 3in wide to be made up into three, five or six coach trains. Fitted with automatic sliding doors. 4-4-0 originally designed O. Busse. The type was built by Neilson in 1894 (Nos. 501-505) and by firms in Germany and Italy. Slide valves were replaced by piston valves. Designed for several applications, but also claimed to be fitted to shunter locomotives used in industrial plants and to shunter and goods engines of a main line British Railway. Locomotive centres of gravity. 133-4. Tests conducted over three days between 20 and 22 April 1937 between St Pancras and Leeds, stopping only at Leicester in each direction; between St Pancras and Leeds, stopping at Nottingham and Sheffield in each direction; and between St Pancras and Manchester (Central) stopping at Leicester and Derby in each direction. 5XP Jubilee No. 5614 Leeward Islands was used on the tests to Leeds hauling 9 coaches and Class 5 No. 5278 with 8 coaches performed the run to Manchester and back. The class 5 att5ained a speed of 91 mile/h at Hendon on the return journey. Railcar braking. 158-60. 3 diagrams. French Railways exhibits in the Palace of Railways in the old Invalides station. Polish State Railways exhibits. O.V.S. Bulleid to be new CME. Maunsell retirement. New into service: Nos. 3210 Earl Cairns, 5084 Reading Abbey and 5969 to 5974. Electrification of the Mount Pilatus Railway Switzerland. 176. Modifications to 400 Class 4-6-0 including rebuilding with two cylinders, rather than four. The Lemaitre improved exhaust system, Northern Railway of France. 184-6. 5 diagrams. Electrification of the Hollental Railway. Germany. 187-90. illustration, 2 diagrams. 2-4-0 with left hand drive built Beyer Peacock? The International Railway Congress at Paris. 192-3. Sirocco built at Kipps Works: the fourth, and last, locomotive to be built there. Painted dark green. Sinclair designs; Figures 10-12: 2-2-2. Developments in steel production by Hadfields Ltd. 198. The International Railway Congress. 201. Reed, K.H. and Fayle, H. Recent developments of Irish locomotive practice, Great Southern Railways. 226-8. Analysis of IMechE Paper by G.K. Ambady of running costs of steam and diesel locomotives on the North Western Railway of India. Refers to series under construction and to coloured sectionalised diagram sold by Locomotive Publishing Co.
Farnborough Miniature Railway. 244-5. 2 illustrations. 10¼in gauge railway owned by A.D. Kinloch,The bulk of the passenger carrying stock is made up of trains of open articulated cars, with bodies varying from 12 to 16 ft. in length. But there are two three-coach trains of covered' 'Pullman" saloon bogie cars, with cushioned seats. To enable passengers to enter and leave these vehicles the roof is hinged. The bogie axleboxes of all the stock have roller bearings. The railway is owned by A. D. Kinloch, of Old Broad Street, London, E.C., who spends nearly every week end driving his trains, assisted by three enthusiastic friends. Re-named twenty of its Castle class locomotives as follows: No. 5043 Earl of Mount Edgcurnbe, 5044 Earl of Dunraven, 5045 Earl of Dudley, 5046 Earl Cawdor, 5047 Earl of Dartmouth, 5048 Earl of Devon, 5049 Earl of Plymouth, 5050 Earl of St. Germans, 5051 Earl Bathurst, 5052 Earl of Radnor, 5053 Earl Cairns, 5054 Earl of Ducie, 5055 Earl of Eldon, 5056 Earl of Powis, 5057 Earl Waldegrave, 5058 Earl of Clanearty, 5059 Earl St. Aldwyn, 5060 Earl of Berkeley 5061 Earl of Birkenhead, 5062 Earl of Shaftesbury. Engine No. 5063, of the same class, has been named Earl Baldwin after the ex-Premier and attached to the Worcester sheds. Engines Nos. 5060 to 5064 are among the latest 4-6-0's completed at Swindon. The names originally allotted to these five engines were Sarum Castle, Sudeley Castle, Tenby Castle, Thornbury Castle and Tretower Castle. No. 5083 has been named Bath Abbey and the name of No. 4066, Sir Robert Home is changed to Viscount Horne and the nameplates have been removed from No. 3411 Stanley Baldwin. New 0-6-0 tank engines are Nos. 3725-7 and 7425-9. Two further engines of the Castle class, Nos. 5064 and 5065, are to be re-named Bishop's Castle and Newport Castle respectively. Engine No. 4007 Rising Star, has been re-named Swallowfield Park and not Swallowfield Hall as stated in our last issue. New tubular coaches, French State Railways . 245-8. All-metal coaches put into service by the French State Rly. with anti-collision reinforcement of the ends, streamlining of the bodies and the arrangement by which the power of the air-brake on the bogies is automatically adjusted to the speed. The coaches weighed only 35 tons yet were 23.263 m. (76 ft. 4 in.) long overall. The weight saving was achieved by constructing the coaches in tubular form and by the use of special steels and light alloys. The principle of building the body and under-frame as separate units was departed from, the coach comprising an integral whole or "monocoque" mounted on bogies. Stream-lined tank locomotive South Manchurian Railway. 251. 2 illustrations. French State Railways that the railway station at Denain-Mines, in North-east France, which had just celebrated its centenary, and the oldest in France, was being demolished. The building was of particular interest, being the terminus of the railway owned by the Compagnie des Mines d ' Anzin, which runs thence to Anzin, a distance 'of nine miles, and near the Belgian frontier. This line, in the Valenciennes district, was one .of the earliest in France, coal trains having been run over it since 1834, and a passenger service was started in 1837 .. Until 1935, one of the very early locomotives - an 0-4-0 tank, named Saint BaTbe-was in regular service, and since its withdrawal has been preserved in the Museum at Anzin. There are still some engines running dating back to 1873, each bearing a name. By the courtesy of Monsieur Pauza, the Director General of the Mining Company, we are able to illustrate the locomotive No. 15, St. Waast, which we are informed is identical in design with No. 3, Saint Barbe, Another interesting relic in the old station building was the clock which was made by Schwilgue, the maker of the famous clock in Strasburg Cathedral. It is worked by weights, with all its parts of bronze, except the pendulum which is of pine-wood. Although it was placed in position when the station was built, it has never been known to stop or need repair, and is certainly worthy of a place of honour in the new station. The Chemin de Fer d' Anzin owns about twenty-three miles of track, and has eighty-two locomotives, thirty-seven carriages, and 3,946 wagons, according to the latest figures. Further standard 0-6-0 freight tender engines recently completed and turned out at Crewe were Nos. 4563-67. The first of the series, No. 4562, was allocated to the Midland Division. The last of the five new streamlined Pacifics, No. 6224, Princess Alexandra, was in service. No. 5387 is the latest 2-cylinder 4-6-0 mixed traffic engine ex Armstrong, Whitworth and Co. delivered to Crewe for service on the Western Division. The following 3-cylinder 4-6-0 locomotives of the Silver Jubilee class were running, fitted with new high capacity tenders in place of the former 3,500 gallon type which had been attached to the first seven Crewe- built 0-6-0's :--Nos. 5567, 5569, 5572, 5590, 5592, 5593 and li602. As originally built these engines were supplied with 4,000 gallon tenders, which were exchanged later for the smaller type with engines of the Royal Scot class. Engines withdrawn included five Princes, Nos. 25602, 25680, 25767, 25779, and 25833; also the following other passenger tender engines: Precursor superheater Nos. 25291 and 25302; George the Fifth class Nos. 25378 and 25382. N.S.R. L class 0-6-2 tank No. 2248 has also been cut up. Additional 2-cylinder 2-6-4 (must have been 2-6-2T KPJ) tank engines turned out at Derby were Nos. 146-7. Decided to concentrate the wagon repair work in the Hull district at the former Hull & Barnsley Railway Locomotive Shops at Springhead (Hull). Provision to be made for lifting wagon bodies, and existing equipment modernised. A.H. Peppercorn, Assistant Mechanical Engineer, Stratford, (acting Locomotive Running Superintendent, Southern Area) to be Locomotive Running Superintendent, Southern Area in succession to I.S.W. Groom who resigned from the service on 31 July. F.W. Carr, Works Manager, Gorton (acting Assistant Mechanical Engineer (Stratfard) , to be Assistant Mechanical Engineer, Stratford, in succession to Peppercorn. J.S. Jones, Assistant to the Locomotive Works Manager, Doncaster (acting Works Manager, Gorton), to he Works Manager, Gorton, in succession to Carr. K.S. Rabertsan, Carriage and Wagon Works Manager, .Stratford, to be Assistant Mechanical Engineer, Gorton and Dukinfield. H.C.L. Edwards, Assistant Manager, Carriage Shops, Stratford (acting Assistant to the Locomotive Works Manager, Doncaster), to be Carriage and Wagon Works Manager, Stratford, in succession to Robertson. D.R. Edge, Carriage and Wagon Works Manager, Dancaster, to be Assistant to the Chief Mech. Engineer, in succession to. O.V. Bulleid who has accepted the position of C.M.E. of the Southern Rly. M. Weeks, Assistant to the Carriage and Wagon Works Manager, Doncaster, in succession to Edge. K.J. Cook, Assistant Locomotive Works Manager, is now Manager of the Swindon Locomotive Works. H. Randle, Assistant to the Carriage and Wagon Works Manager, Swindon, is now Assistant Loco. Works Manager. W.F. Wegener, assistant chief mechanical engineer, to be chief mechanical engineer, Federated Malay States Railways. A.R. Loveridge, to be assistant locomotive superintendent, Tanganyika Railways. E.R. Masters, assistant locomotive superintendent, to be office assistant (technical) locomotive department, Tanganyika Railways. Railway developments at York. 267. In connection with the enlargement of the L.N.E.R. station at York, one of the largest contracts ever given to a railway signalling contractor has been let to the Westinghouse Brake & Signal Co. Ltd. for the purpose of installing the most up to date colour light signals. These will be provided from Coprnanthorpe and Naburn , thence through York to Poppleton Junction, 1½ miles northwards, to join up with the existing colour light signalling which extends onwards to Northallerton and Darlington. This new installation which will be of the relay interlocking type, will be the largest of its kind in the world. It will be controlled from one new signal box of entirely novel design, situated in the centre of the station, from which about 300 points will be operated; these will be worked by compressed air electricaIly controlled, except in the case of the more remote ones at the large double junctions at Chaloners Whin where "all electric" motors will be used. Some 32 miles of actual running lines will be completely track circuited for the purpose of controlling the points and signals. The track circuiting, comprising no less than 340 separate sections, will all be indicated in the new signal box on the control panel of unique design, together with the complete indication of all points and signals; also all requirements regarding shunting movements and the starting of trains in and around the station will be indicated to the signalmen. Though many of the points will be as far away as two miles, and some of the signals more than three miles, from the signal box, these will be operated by simply turning a small thumb switch, the system being what is known as route signalling. It will only be necessary for the signalmen to work one switch to set all points in the correct position and clear the appropriate signal for any particular route to be traversed by a train, but over 800 such routes will require to be provided for. A very definite indication will be displayed to the drivers by a special type of electrical Route Indicator working in conjunction with the respective signal, thus avoiding any possibility of misunderstanding. An efficient lock nut with many advantages, and which has the approval of the Air Ministry, is the Simmonds Nut. In design it is a standard nut with its height slightly increased to incorporate a collar of special fibre. This collar has an internal diameter slightly less than the diameter of the bolt, and is itself initially not threaded. Before the bolt reaches the fibre collar the nut has every property as well as every shortcoming of a conventional nut, for the play between the threads is to specification tolerances. It is this play, necessary as it may be for easy assembly, that is the main cause of an ordinary nut, slacking off under vibration. With the Simmonds nut, when the bolt has passed through the threaded portion of the nut, and reaches the fibre collar, this collar, due to its smaller hole, momentarily resists the further advance of the bolt. In overcoming this resistance the bolt presses against the collar, and in so doing it forces the nut upwards, i.e., away from the head of the bolt, until the sides of the thread are in contact. To construct a large carriage shed' and marshalling sidings on a site near the Stonebridge Park Power Station to give accommodation for 600 coaches, while the new shed will make it possible for 200, coaches at a time to be prepared, under cover. Pulverised--fuel streamlined locomotive, German State Railways. 270. illustration. Additional 4 class 0-6-0 freight tender engines completed at Crewe were Nos. 4568-71. The latest 4-6-0 mixed traffic engine in service ex Armstrong Whitworth and Co. was No. 5401. No. 9009 has been converted fram class D to class G1 (superheater) and provided with a standard Belpaire boiler. Only three ex L.N.W. non-superheated 0-8-0s remained for conversion to class G1, viz., class G Nos. 9070 and 9134, and class D No. .9040. These, when converted, would bring the total number of G1s up to 449. "Silver Jubilee" class 4-6-0 locomotives Nos. 5588 and 5604 were running with new high capacity tenders, similar to' those referred to in the August Locomotive. Six others, making a total of fifteen, were to be sirnilarly fitted as they passed through the shops. Several 4-4-0 George the Fifth and 4-6-0 Prince of Wales class locomotives had been under repair at Crewe. Engines recently turned out rebuilt with standard Belpaire boilers included Prince of Wales" class 4-6-0 No. 25827; also class G1 Nos. 9327 and 9391. Recent withdrawals comprised ex N.S.R. 0-6-2 tank No. 2248; also the following ex L.N.W. classes :-Prince of Wales 4-6-0 class No. 25692; 4-4-2 Precursor tank No. 6829; 0-6-0 tank No. 27529 (North London), 0-6-2 coal side tank No. 27600; 4-4-0 No. 14352 (Caledonian), and 0-6-0 No. 3125 (Midland). Two standard gauge Iizht-weight bogie vehicles for the Ferrocarril Central del Peru designed on entirely new lines developed by D. Wickham and Co. Ltd. of Ware, Herts., the builders of the cars in accordance with the requirements of Mr. Jefferson, chief mechanical engineer, and in collaboration with Livesey and Henderson, consulting engineers. No special underframe is used with the car bady which is made entirely of steel tubes of either round or square section. Reed, K.H. and Fayle, H. Recent developments of Irish locomotive practice, Great Southern Railways. 283-4. Morris, O.J. Standardizing Southern Railway locos., Central Section. 291-2. The operation of special express trains at above speeds limited the overall train services which could be operated and restricted the overaul locomotive availability. The only gain noted was an increase in publicity. London & North Eastern Railway. 303. Further series of 2-6-2 engines of V2 class completed at North Road Works, Darlington: Nos. 4778 (to Heaton); 4779, 4780 The Snapper, 4781 and 4782 (to York), 4783 (to Heaton), and 4784 to the Southern area. Recent withdrawals included 4-6-0 No.788, 0-6-0 No. 1592, and 349 and Nos. 2462 and 2474 of the J23 0-6-0 class. The name-plate on No. 4780 is quite elaborate; mounted over the middle drivers it incorporates the regimental colours, the full lettering being: The Snapper, East Yorkshire Regiment, Duke of York's Own. 4-4-0 passenger engine, No. 244, Egyptian State Rlys., with Caprotti valve gear. 304. 26 locomotives completed by North British Locomotive Co. Ltd. of Glasgow for the Egyptian State Railway. Intended for moderate speeds and fairly light trains on the level roads of Northern Egypt, eighteen of these engines were coal burners, three of which were fitted with Nicholson thermic syphons in the fireboxes, whilst the remaining eight were arranged for burning heavy oil fuel; the burner for the oil was arranged at the front of the fire pan. The inner firebox was of steel for all the engines, and steel tubes were used throughout. There were two outside cylinders, 17 in dia. by 26 in. stroke with Caprotti valve gear. The coupled wheels were 5 ft. 6¾ in. diameter. New engines completed at Swindon: 4-6-0s Nos. 6830 Buckenhall Grange; 6831 Bearley Grange; 6832 Brockton Grange; 6833 Calcot Grange; 6834 Dummer Grange; 4-4-0 No. 3214 (Dukedog) ; 0-6-0PT Nos. 3732-5; 2-8-2T No. 7240. Recent withdrawals included 0-6-0T No. 671 (Alexandra Dock, No. 16); 0-6-0 tank No. 1802; 0-6-0 tender No. 2390; 4-4-0 tender Duke of Cornwall class No. 3252; 2-8-0T Nos. 4202, 4220 and 43XX 2-6-0 Nos. 4305, 4330, 4352, 4362, 4373 and 4393. In consequence of the decline in local traffic, the passenger service between Clynderwen and Fishguard Harbour, via Rosebush and Letterston, was withdrawn on 25 September 1937. Goods, mineral and other merchandise traffic was still be dealt with at Llangefni, Maenclochog, Rosebush, Puncheston and Letterston stations only. A new halt at Six Bells, between Abertil1ery and Aberbeeg opened on September 27. Steam locomotives of the London Passenger Transport Board were now overhauled at the Stratford Works of the LNER. Ex-Metropolitan Rly. 4-4-4 tank locomotives Nos. 105 and 106 were under repair at Stratford. The old locomotive shops at Neasden were demolished to make room for further electric stock sheds. Transfer to Stratford was via Finchley Road and South Tottenham. Weston, Clevedon & Portishead Ry. 304. This line has now taken over Southern Ry. engine No. 2653, an ex-L.B.S.C. "Terrier" tank, formerly No. 53 Ashtead, and now No.4 on the W.C. & P.R. It is painted green with yellow lettering. .
2-10-2 locomotive, Tientsin-Pukow Railway. 305-6. illus. Built by Krupp for service in China: had bar frames. New Russian electric locomotives. 306-8. illus., diagr. (s. el.). Co-Co locomotives of the VL and SK types built at the Kolumna Machine Works. London, Midland & Scottish Railway. 308. Last of series of class 4F 0-6-0 freight tender engines (Nos. 4562-4576) completed at Crewe: all fitted with tenders of former standard 3,500 gallons type interchanged for new high capacity tenders with engines of the 4-6-0 Silver Jubilee class. Series of 25, 2-6-2 passenger tank engines (class 3), under construction at Crewe; these would bear numbers from 185 upwards. Further 2-cylinder 4-6-0 mixed traffic engines had arrived at Crewe from Armstrong, Whitworth & Co., the latest in service being No. 5416. The last of the series, No. 5451, was due for delivery about the middle of December. Engines recently turned out at Crewe rebuilt with standard Belpaire boilers included: 4-4-0 superheated Precursor No. 25279 Sunbeam; 4-6-0 Prince of Wales class No. 25818; and 0-8-0 class G1 Nos. 8913, 8922, 9161 and 9734. Withdrawals included 4-4-0 George the Fifth class No. 25360 Beagle; 4-6-0 Prince of Wales class No. 25692, also G.& S.W. 4-4-0 engine, No. 14521; and 0-6-0 coal saddle tanks Nos. 27462 and 27470. These two latter were converted from tender engines during Whale's regime at Crewe. Other tank engines withdrawn included 4-6-2 L.N.W. No. 6989; 4-4-2 No. 6829; 0-6-4 Midland No. 2003; 0-4-4 No. 1325, and 0-6-0 No. 1819. A further two Baby Scots had been recently named: No. 5526 Morecambe and Heysham and No. 5527 Southport. At Derby new 2-6-2 passenger tank engines are in traffic up to No. 150. A further ten streamlined Princess Coronation class Pacific type locomotives were to be built at Crewe for 1938 summer's traffic. Reed, K.H. and Fayle, H. Recent developments of Irish locomotive practice, Great Southern Railways. 309-11. 5 illus. Continued from page 284. Nos. 403 and 405 as rebuilt with K type boiler, Latter illustrated. 139 locomotives were taken into GSR stock from the Midland Great Western Railway in 1925. Notes that D16 class 4-4-0s Nos. 531 and 534 were rebuilt bwith X type superheated boiilers in 1932. No. 531 also received larger 17 x 24in cylinders. Class was still working the Mayo line between Athlone and Achill. K class 2-4-0 (GSR G2 class): thirteen rebuilt at Inchicore with Y class superheated Belpaire boilers. A class 4-4-0 (GSR D5): No. 124 (524) rebuilt with Belpaire boiler following deliberate derailment at Streamstown in 1924; Nos. 126 and 128 similarly rebuilt. Subsequently renumbered 545-550. C class 4-4-0s regrouped into two classes: D7: those with Robinson superheaters and D slide valves (subsequently, Nos. 536, 537 and 539 fitted with X type superheaters); and D6 with higher-pitched Belpaire boilers (see also Locomotive, 1918, April)..
Sixteen cyl. 4-8-4 loco., Baltimore & Ohio R.R. 311-12. Sixteen 9½ x 7in cylinders arranged for constant torque propulsion on the Besler system and intended to haul 14 standrad Pullman cars at 100 mile/h and developing 5000 horse-power. The motion and gears were to be enclosed and continuously lubricated. No counterbalancing required. Emerson water-tube boiler to work at 350 psi..
[Closure of Methven branch to passenger traffic]. 312. [Closure of Westport to Achill line, Great Southern Railways]. 312. To all traffic on 1 October 1937. [Retirement of E.A. Forward]. 312. Keeper of rhe Engineering Division, Science Museum: retirement on 5 September 1937. Trained at Bow Works of North London Railway. Joined Museum in 1901. Inspection train, Shropshire and Montgomeryshire Railway. 312. illus. Photograph of No. 1 Gazelle at Shrewsbury Abbey Foregate station with four-wheel coach: notes how built by Alfrred Dodman & Co. of King's Lynn as a 2-2-2, rebuilt as 0-4-2 by Bagnall in 1911, and reconditioned at Kinnerley by Mr Owen. Lists locomotive stock then available. Institution of Locomotive Engineers, Lt.-Col. F.R. Collins, President, 1937-8. 313-14. illus. (port.). Biography and Presidential Address (abstract of): see J. Instn Loco. Engrs, 1937, 27, 461 for former and 586 for latter. Lateral thrusts at high speeds. 314-15. Tests conducted by the PLM Railway betwen Paris and Lyons and Marseilles with streamlined Atlantic locomotive 221-A-3 and Pacific locomotive 231-D-187 to establish lateral thrusts at high speed. The Atlantic produced transient thrusts of 4.7 tons on the first coupled axle on straight track at 80 mile/h. The Pacific produced a maximum lateral thrust of 6.4 tons at 81 mile/h on straight traffic. Increasing the lateral force applied by the leading bogie and thinning of the tyres on the leading coupled axles reduced the thrust. Trentham Miniature Railway. 315. illus. Two-foot gauge railway wirh petrol engined steam-outline locomotives constructed by E.E. Baguley Ltd. The Hunslet Engine Co. 315. Order from the Peruvian Corporation for a diesel-mechanical locomotive to work under exceptional altitude conditions: to be capable of haulng considerable loads up severe inclines (worst stretch being 1 in 14) from sea level up to and including an altitude of 14,000 ft. The engine to be manufactured by Mirrlees, Bickerton & Day, and at normal sea level rating capable of developing up to 330 b.h.p. The Buchi supercharger, being on the turbine principle, would have a natural compensating effect as altitude increases. A Vulcan-Sinclair hydraulic coupling to be fitted,.sm, and automatic control. Consulting and inspecting engineers Messrs. Livesey & Henderson. New locomotives for German secondary railways. 316-17. 2 illus., diagr. To assist with conveying National Socialists on "country hiking excursions" between Southofen and Obersdorf and Mark Obersdorf and Fussen the Munich Local Railway Company ordered 0-8-2Ts with Krauss-Helmholtz bogies from Ktauss Maffei. The Schaftlach-Gmund-Tegernsee Railway acquired 2-8-2Ts with Krauss-Helmholtz bogies at both ends. These locomotives had to be able to cope with 1 in 33 gradients, severe curvature and light bridge structures. Winter session opened 9 September at Royal Scottish Corporation Hall in Fetter Lane with paper by J. Simmons "Some railway schemes in the West Midlands, 1833-1865" within an area bounded by Worcester, Banbury, Didcot and Stroud and dealt with proposed station at St. Giles in Oxford and GWR carriage factory at Cripley Meadow in Oxford. Other than noting that two A4 Pacifics had been selected to operate the service (Nos. 4495 Golden Fleece and 4496 Golden Shuttle) and the demanding schedules of nearly 68 mile/h in the up direction and slightly over 68 mile/h in the down direction and average speeds to and from Bradford to London in excess of 63 mile/h in spite of reversal at Leeds and haulage by two tank engines over ten difficult miles, the feature is about the new rolling stock and its luxurious interior noting involvement of Murray Adams Acton of Acton Surgey Ltd, use of Rexine and pressure ventilation..
[Mechanical coaling plant, Stranraer locomotive depot, LMSR]. 321. All steel construction with overhead bunker holding 25 tons of coal. The Storstrom Bridge, Denmark. 321-2. illus. A road and rail bridge, nearly 2¼ miles long opened by King Christian X on 26 September 1937. Contractors: Dorman, Long & Co. The Marshall diesel tractor. 322. 2 illus. Agricultural tractor adapted to needs of railway shunting: shown working at Corporation Quay, Sunderland. Phillipson, E.A. The steam locomotive in traffic. II. Departmental organisation: function and policy of headquarters. 323-5. 2 diagrs. Staffing arrangements Next part p. 349..
Obituary  Sir John Dewrance. 325. Son of John Dewrance, locomotive superintendent of the Liverpool & Manchester Railway. Head of Dewrance & Co. engineers. Died aged 79 on 7 October 1937. He was patentee of "numerous" engineering inventions. In 1899 he became chairman of Babcock & Wilcox Ltd. and of the pioneering companies in the Kent coalfield. During WW1 he was a member of the Advisory Committee of the Treasury, the Ministry of Munitions, the Ministry of Labour and the Department of Overseas Trade. He was made a K.B.E. in 1920. He married a granddaughter of Richard Trevithick (she died in 1922). Obituary  Mr. H. Chambers. 325. Gives date of death, notes his period with Beyer Peacock as senior draughtsman, and that was personal assistant to Stanier when he died. Obituary  R.G. Peckett. 325. Died at Spring Lake, New Jersey on 23 September 1937, aged 69. Former chief mechanical engineer Egyptian State Railways. Spanish electric locomotives. 325-7. 2 illus. Three series of 1500V dc overhead electric locomotives: 7000 for Barcelona to Manresa section; 7100 series for Barcelona to San Juan de las Abadesas including the branch from Ripoli to Pingcerda giving access to the French frontier. The 7200 series were designed for hauling heavy expresses on the Irún to Alasua section, The 7000 and 7100 series were constructed by Compañía Euskalduna of Bilbao with Oerlikon electrical equipment and the 7200 series by Babcock & Wilcox of Bilbao with Brown Boveri electrical equipment. Sanders, T.H. The Belleville washer spring. 328-31. 4 diagrs. Invented by Julien Francois Belleville and patented in England in 1866. See p. 268: the three diesel shunting engines had been delivered and numbered 1-3 and were in service at Norwood marshalling yard. From 1 October 1937 Medstead station renamed Medstead and Four Monks. From 27 September 1937 Chilwell station reverted to name Attenborough. Monk Bretton station (between Cudworth and Barnsley) closed from 27 September 1937. During October 1937 LMS conducted dynamometer car tests between Bristol and Leeds via Birminghm, Derby and Sheffield, and between Leeds and Glasgow St Enoch via Carlisle, Dumfries and Kilmarnock to study the possible acceleration of services. Derens, L. The Dutch State Railways Company. 331-3. 4 illus., diagr. Improved train services, G.E. Section. L.N.E.R. 333-4. illus. Arrival at Liverpool Street of first up East Anglian express hauled by No. 2859 East Anglian on Monday 27 September 1937. The service was aimed at Norwich and Ipswich business men to be able to spend mornings in their offices and afternoons in the City with lunch and dinner on the train.. Conversion of a railway to a road. 334. Railway to Key West in Florida converted to a highway. See also letter from C.B. Branston on p. 359. Peat or turf requires a broad but short grate with closely spaced firebars which need to be nearer to the crown of the firebox. A thin fire is needed with a low draught. The Glasgow & Garnkirk Railway experimented with peat burning in the 1830s. A report: On the use of turf as fuel for railway engines prepared by the Britsh Consul in Munich on experiments in Bavaria. There were experiments on the line between Paris and Lyons, on the Grand Trunk Railwayof Canada in 1868 and on the Hartford & Springfield Railway. Colour light signalling, Great Southern Railways. 335. Existing system between Amiens Street and Westland Row being extended to Dun Laoghaire. Air-conditioning in Indian rolling stock. 335. GIPR for service between Bombay and Delhi. Modern locomotives of the L.M.S. D.S. Barrie. Locomotive Publishing Co.
Notes that cover illustration was colour painting by M. Secretan. The Railway Handbook, 1936-7. Railway Publishing Co.
British locomotive types. Railway Publishing Co.
113 diagrams, including new Q class of SR.
Locomotives of the Great Southern Railways of Ireland. S.J. W. Arthur H. Stockwell. Very little descriptive matter in dealing with the locomotive types. The North London Railway. R. Michael Robbins. Oakwood. Order from Rohilkund and Kumaon Railway for four 4-6-0 passenger locomotives to be built to inspection af Messrs. Rendel, Palmer and Tritton. Silver Jubilee train of the LNER had been running for over two years, during which period it had run over 260,000 miles. This express covered 2,680 miles a week at an average speed between King's Cross and Darlington of 71.65 m.p.h., and between King's Cross and Newcastle of 67.08 m.p.h., the maximum speed being limited to 90 m.p.h. During the whole period there have been only two cases of hot axleboxes on the engines working the train. The axle boxes of the engines working these expresses are lubricated by Wakefield Silver Jubilee engine oil, and Wakefield mechanical lubricators supply oil to the axleboxes, valves and cylinders. Orders received from Crown Agents for the Colonies, for 29 sets af "Ajax" grease lubricating equipment for Nigerian Railways locomotives to be converted from oil to grease lubrication; Madras and Southern Mahratta Railway for 160 "Ajax" axlebox grease lubricators for converting 2-8-0 and 4-6-0 type lubricators from oil to grease lubrication; as well as four Nicholsan thermic syphons fer feur locemetives under constructien by Messrs. Thunes Mek. Verkested of Oslo, for the Norwegian State Railways, and four Nicholson thermic syphons for four 4-6-2 locomotives under construction by the Vulcan Feundry Limited fer the Buenos Aires Great Southern Railway. With Fairfield Shipbuilding and Engineering Company for 30 fifty-ton bogie bolster trucks; Hurst, Nelson and Co. Ltd., Motherwell, fer 30 twenty-ton double bolster trucks; Metropolitan Cammell Carriage and Wagon Company, Birmingham, 60 twenty-ton double bolster trucks; and Chas. Roberts & Co. Wakefield, far 60 twenty-ton double bolster trucks. The article which appeared in our issue for August, dealing with several new locomotives of what may be called experimental designs, will have been perused with interest by our readers. In all, reference was made to seven projected types to be tried on the French Railways under the auspices of the O.C.E.M. Of all the proposals, probably the engine being constructed by the Swiss Locomotive and Machine Works on what is called the "Winterthur" system is the most pretentious, incorporating as it does a boiler of a water tube type designed to carry steam at the high pressure of 853 lb. per square inch, which, in turn, is to be used by high speed enclosed reciprocating engines operating on the uniflow principle. Further, the engines are single-acting) which accounts for the fact that no fewer than eighteen cylinders are required. Generally this locomotive may be said to be a development of that built by the same firm some ten years ago and fully described in the LOCOMOTIVE for April 1928. The locomotives illustrated, including the "Winterthur" design, are non-condensing; in other words, they rely on 'the exhaust for providing the required draught and thus, so far as the thermal efficiencies of the engines, apart from the boilers, are concerned, will be directly comparable with locomotives of orthodox type. It will be interesting to consider this aspect of the case a little further. For engines of this description, the actual heat available for transfer into mechanical energy can be conveniently taken, for comparative purposes, as the difference between the heat content in the superheated steam at the boiler working pressure and that in the exhaust at the pressure of the atmosphere; further, the efficiency of the engines can be measured by taking it as being proportionate to the amount of heat used compared with that available. In actual practice the exhaust cannot be carried to atmospheric pressure, as for any given boiler the pres- sure in the exhaust passages will be roughly proportional to the steam supply or rate of evaporation; further, steam chest pressures are lower than the boiler pressure. However, when considering any new design of steam locomotive and the probable effect that any modifications to the engines may have on the steam consumption, the foregoing observations should be kept in mind. All the locomotives under review have for one of their objects, at any rate, improved engine efficiency compared with the ordinary simple expansion type. Such being the case, it may be interesting to carry this discussion a little further by considering, in the first place, the "Winterthur" locomotive. Assuming that steam at a pressure of 835 lb. per square inch and having a total temperature of 800°F is supplied to the cylinders, then each pound of steam will carry a heat content of 1,398 B.Th.U.s, and if adiabatic expansion to standard atmospheric pressure is also assumed, the heat available is 361 B.Th.U.s per pound of steam supplied, or, in other words, the ideal water rate per cylinder horse power hour would be 7.05 pounds, a figure which, as it represents 100% efficiency, could not be realised. In order to improve the cylinder performance, the "Winterthur" proposal employs the uniflow system, thus enabling the exhaust to escape through portways entirely separate from those used by the inlet steam; the reason for this is that . it is expected the cylinders will utilise a large part of the heat admitted and that in consequence the steam at exhaust may contain a high percentage of moisture. The turbine locomotive will now be considered; here the working steam pressure is 355 lb. per square inch, and a boiler of the usual type is used. Assuming again a total steam temperature of 800 degrees Fah., we have a total heat content of 1,420 B.Th.U.s per pound, and with exhaust to standard atmospheric pressure, the available heat per pound of steam is 310 B.Th.U.s, giving an ideal steam rate of 8.22 lb. per horse power hour. Consideration of these two examples brings out a further point, which is the additional advantage to be had by very high pressure steam as indicated by the two ideal water rates, or, if preferred, the two values for the available heat per pound of steam generated under the conditions stated. The L.M.S. turbine locomotive is so similar to those of the "Princess" class that a direct comparison can probably be easily made. This is, however, not so in the case of the French locomotives: however, it will be a comparatively simple matter to determine, with the aid of the Vitry testing plant, how these two power unit's compare. We have, so far, said nothing of the boiler, which is 'father similar to those used for the high pressure locomotives on the Delaware and Hudson, and that experimentally used by the Baldwin Locomotive Works for the three-cylinder compound engine constructed for testing purposes some ten years ago, the firebox being of the water tube pattern, while a barrel section is fitted much as usual, and a superheater, which seems of ample proportions is provided. The water tube type of boiler has so far had a somewhat checkered career in locomotive service, though it has in the past, and still is, receiving a fair amount of attention. For pressures so high as 835 lb. per square inch, there is no alternative when a boiler of otherwise conventional design is desired. In selecting these two locomotives as a basis for discussion, we have done so .for the reason that they are the farthest removed from the normal type of locomotive, as the others, save the Bugatti, have something in common with the usual form of construction and, in addition, it will in due course be of more than ordinary interest to learn how a reciprocating engine working on the uniflow principle will compare with a turbine, the point here being, of course, that both are in effect uniflow, and that the reciprocating engine, therefore, will, have a constant heat drop through its working cycle and, like the turbine, the inlet steam passages will not be alternatively heated and cooled as is the case with the usual contra flow reciprocating engine. In considering any innovation in locomotive de- sign, the ultimate "yard stick" by which success or failure will be measured is actual performance on the road under every-day conditions. Reliability in service and low upkeep costs count for much, and, unless these characteristics are satisfied, no locomotive has any chance of permanent success. New 4-6-0 type engines completed at Swindon: Nos. 6835 Eastham Grange, 6836 Estevarney Grange, 6837 Forthampton. Grange, 6838 Goodmoor Grange, 6839 Hewell Grange, 6840 Hazeley Grange, 6841 Marlas Grange, 6842 Nunhold Grange; also 0-6-0 tank engines Nos. 3736 to 3743 and 2-8-2 tanks Nos. 7241-2. Engines withdrawn during September include Nos. 1265, 1629, 1814, 0-6-0 tanks; No. 1500, 2-4-0 tank, Nos. 3262, 3420 and 3404 Barbados, 4-4-0 tender; Nos. 4316, 4321, 4322 and 8363, 2-6-0 tender engines. New Hudson Type Locomotives, Canadian Pacific Railway. 338-9. Designed by H. B. Bowen, Chief of the Motive Power and Rolling-stock Dept. of the Canadian Pacific Railway, and constructed by the Montreal Locomotive Works, thirty new 4-6-4 express locomotives were in hand, to be capable of hauling heavy trans-continental trains more than 800 miles without changing engines. They wereassigned numbers 2820 to 2849 inclusive, and placed in the H.l.0 class of the C.P.R. The design was semi-streamlined appearance, as first developed in the Jubilee class engines. The exterior of the locomotive was smooth in appearance, with no projecting head- light, chimney, dome, or other parts. Sloping lines of the front merge into the horizontal lines of the footplate and boiler in such a manner as to convey an aspect of capacity for sustained high speed. Five of the new engines, Nos. 2838 to 2842, were provided with the latest type of locomotive booster. These are for the service between Toronto and Fort William, 813 miles, without change of locomotive. The boosters assist in smoother starting, and should be of value in maintaining schedules of long passenger trains over heavy grades and on the curves encountered on this section. The "East Anglian" trains L. & N.E.R.. 339-41. 3 illus., diagr. (s. el. ), plan. Mainly about rolling stock and train times which were far from fast: even slower than 2012. Streamlined B17 No. 2859 East Anglian illustrated. The elevation and plan are of the train: externally standard Gresley: internally like the streamliners operating out of King's Cross. The first three of a series of 2-6-2 passenger tank engines (class 3) had left the Crewe shops, Nos. 185-7. They were the first of the type to be constructed at Crewe, all previous ones having been built at Derby. Further two-cylinder 4-6-0 mixed traffic engines delivered to Crewe ex Armstrong, Whitworth and Co. bear Nos. 5417-31. Those numbered from 5363 upwards are all in service on the Western division. No. 9040, the last of the non-superheated D class 0-8-0's, had been converted to superheater and assimilated to class "G1." As class D this engine was fitted with a round-topped boiler; it was now provided with a standard Belpaire boiler and, in addition, with the vacuum brake in place of the former steam brake. Engines recently rebuilt at Crewe with standard Belpaire boilers included 4-4-0 George the Fifth class, Nos. 25348, 25371 and 25392; also 4-6-0- Prince of Wales class, No. 25751. Recent withdrawals included 4-6-2 superheater tanks, Nos. 6975 and 6990; 4-4-2 Precursor tank No. 6800; and ex N.S.R. 0-6-0 tank No. 1567. The latest 2-6-2 passenger tank engine ex Derby was No. 157. Engines recently scrapped at Derby included 0-6-4 tank No. 2001 and 0-4-4 tank No. 1325. One of the new standard 2-6-2 tanks, No. 136, is on trial in the Highland area, with a view to this class working locals between Tain, Inverness and Keith. Arrangements had been completed for the British railways to be represented jointly at the Empire Exhibition to be held at Bellahouston Park, Glasgow, from May to October, 1938. Plans have been approved for the construction of a Joint Railway Pavilion on a commanding site situate on the main avenue from the entrance in Mosspark Boulevard. The rear section of the pavilion will be semi-circular in shape and will house a working model railway, representative of the four main line railway companies. 2-8-0 Type Locomotive, Trujillo Railway, Peru. 342. illus. Illustration shows a 2-8-0 type superheated locomotive with an eight-wheeled tender built by the Hunslet Engine Co. Ltd., Leeds, for the Peruvian Corporation Ltd., for their 3 it. gauge Trujillo Railway, and to the inspection of Messrs. Livesey & Henderson, London, the Consulting Engineers. As the engine is required to haul loads of 400 tons behind the tender, up inclines of 1 in 50 over considerabledistances, exceptional boiler capacity had to be provided, and it is interesting to note that in designing the engine the builders have been able to arrange the weight distribution so that the maximum variation on any of the coupled axles axles is only 1½ cwt. Further 2-6-2 engines of the V2 class completed at Darlington Works are Nos. 4785, 4786, 4787, and 4788. New class A4 Pacifics completed at Doncaster Works were Nos. 4497 Golden Plover, painted green, and No. 4498 Sir Nigel Gresley, painted blue. The latter is the one-hundredth Pacific type locomotive, built to Sir Nigel Gresley's design. No. 10000 has been rebuilt at Doncaster as a three-cylinder engine with a P2 class boiler, like the Mikado type coal engines working at 250psi. It is also fitted with a Kylchap double chimney. It is completely streamlined and painted blue. Recent withdrawals are B15 class, 4-6-0, No. 786; J5 class 0-6-0 tanks, Nos. 2496 and 2527, also J23 class 0-6-0 No. 2469 with domeless boiler. Arrangement has been made by the L.N.E.R. for a permanent exhibition of framed prints depicting events in the reign of Queen Victoria in the first class waiting room at Lincoln Station. A comprehensive scheme of improvement and modernization to King's Lynn station has been approved by the directors and work will begin at once. We are informed that the streamlined tank locomotive illustrated .in our issue of August 15 last was built by the Kawasaki Shargo Kaisha Ltd. of Japan. 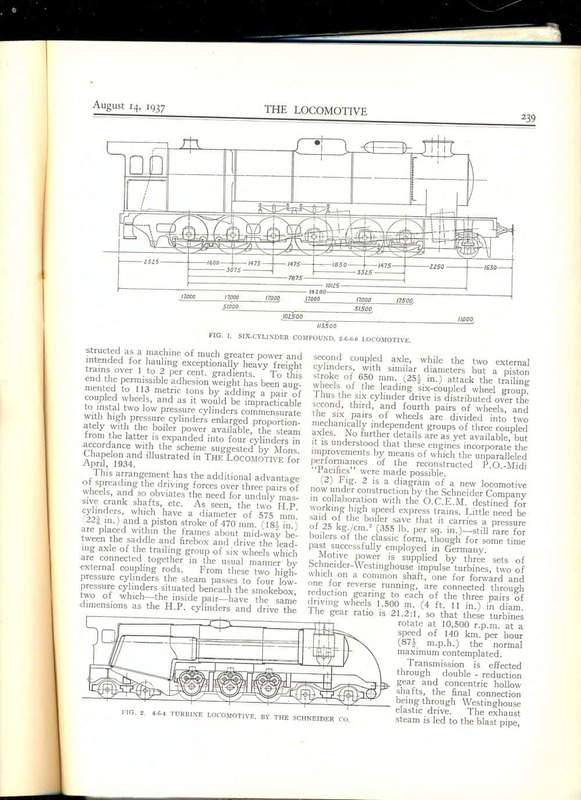 Institution of Locomotive Engineers: the proportions of locomotive boilers. 343-4. At the meeting held on 27 October in the Hall of the Institution of Mechanical Engineers, A.F. Webber, Associate, read a paper on "Locomotive Boiler Design," of which we give the following abstract. Mentioning the high standard of performance of the Stephenson locomotive boiler, comparison was made with stationary boiler practice. The essentials of effective boiler design are distinguishing features of the Stephenson boiler, in the completely water-cooled combustion chamber, efficient convective heating surface, and comparatively strong draught, giving high gas speeds, and in its immediate effect the steam locomotive appeared complete. It is this direct-acting reciprocating steam locomotive, altered only in propor- tions, especially as far as the boiler is concerned, which is to-day still responsible for moving the bulk of the world's land transport. Reviewing the developments in stationary boiler practice, the steam output of a Lancashire boiler has been more than doubled in recent years, but these results are completely eclipsed by the astonishing combina- tion of high output and high efficiency of the modern locomotive boiler, even more astonishing when attention is given to the restricted dimensions and the enforced absence of economisers and pre-heaters on which the stationary boiler so largely depends. The development of really high-speed express trains of limited weight accompanied by a general acceleration of heavy main line trains running to more ordinary schedules may result in greater demands on the locomotives, The steaming capacity is severely tested when time is being kept (or regained) on long adverse gradients; the importance of cylinder design is not quite so paramount as where extremely high speeds of well over 90 m.p.h. have to be attained. Therefore the maximum possibilities of the steam locomotive must be considered seriously, and in the author's opinion the boiler comes first. Emphasis is laid on the value of a "free-steaming" boiler to the load-hauling capacity of the locomotive, even at the expense of a slight loss of thermal efficiency. It will be realised that a modification to a given engine which will enable it to do the same work for 10 per cent. less fuel, is less valuable than a modification which will enable it to do 10 per cent. more work for the same fuel consumption. In the one case a certain item in the overall cost of transport (admittedly an important item) has been reduced, in the other case, not only is the fuel-power conversion more efficient, but the locomotive has become a very much more valuable unit of the railway service. This is confirmed by the frequent instances in which a class of locomotive has been rebuilt with larger boilers and thereby transformed from et condition where the performance has been disap- pointing in. relation to the weight, cost, and general dimensions of the machines, to a condition in which the engines have proved valuable and effective units. Even where the performance in the original condition has been quite good, the provision of a larger boiler has often enhanced greatly the effective transport value of the locomotive. An example of this (though not strictly a case of re-boilering existing locomotives) is given by the comparison between the small and large boilered Great Northern Atlantics. Though both classes are almost identical, apart from the very different boilers, the earlier engines have been for long relegated to secondary duties, while the larger engmes have only just been displaced from working the 290-ton Pullman trains on schedules demanding a very high standard of locomotive performance. Such locomotives are, from the operating point of view, of infinitely greater value than the earlier " Atlantics," and these considerations should be kept in view when discussing boiler design.
. When it comes to getting the maximum possible output from the locomotive, this is essentially a boiler problem. Since the multi-cylindered locomotive has been generally adopted for high powered machines there is no difficulty in fitting cylinders large enough to utilise efficiently (at not too late a cut-off) all the steam that the boiler can deliver. The effect of front end design on maximum output is chiefly that the more efficiently the steam is utilised the greater effective output can be produced from a given maximum evaporation. The design of the boiler is far more stringently restricted by space limitations, and it is for this reason the author considered boiler design to be the key to the future development of the steam locomotive. He is inclined to believe also that the recent developments in front end de- sign have not been quite paralleled by progress in boiler design. The real difficulty is to separate free steaming from coal eating. The boiler must be capable of burning coal at a high rate. When so doing, the coal must be completely and efficiently burnt. When this is done, the boiler heating surface must be capable of transmitting a high proportion of the resultant heat to the boiler water to form steam. An arrangement of small bore boiler tubes may give a high thermal efficiency, but given vacuum in the smokebox, will not give sufficient draught in the firebox for the combustion of coal at an adequate rate. It will be necessary to sharpen the blast by restricting the exhaust nozzle or by working with a partly closed regulator and a late cut- off, giving a high cylinder release pressure. Neither expedient is economical, but the real weak- ness of the design is the inability to produce enough steam for heavy load hauling. The tube system must be so designed that it will not absorb too much of the smokebox vacuum for propelling the gases along the tubes. The firebox grate area is also closely associated with good steaming qualities, since a high rate of finng per sq. ft. of grate area requires a greater draught in the firebox to induce the enormous volumes of air through the firebed. The grate area also affects the boiler efficiency very much, since, one of the most serious sources of heat loss is the loss of solid unburnt fuel which increases rapidly at high ratings. Regarding the importance of the area through the tubes T. Grime in his paper (Steam Locomotive Performance, I.L.E. Journal No. 75, p. 604). stated that the maximum evaporation depends solely on this factor, and giving as a maximum figure 7,000 lb of steam per hour per sq. 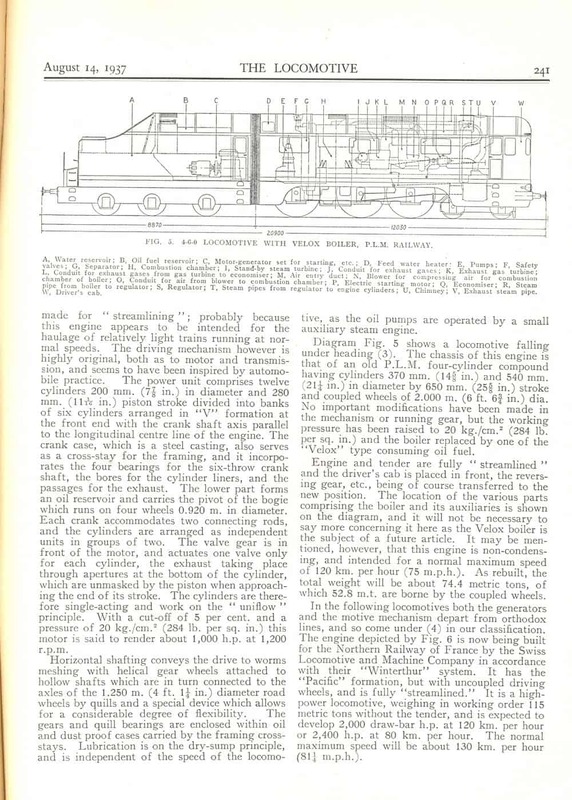 ft. of tube area, while E. W. Selby (Practical Points in Locomotive Design, LL.E. Journal No. 66, p. 493) suggests that the area through the tubes should not be less than one-fifth of the grate area. It would seem diffi- cult to maintain the last mentioned ratio with the large grates of modern "Pacific" locomotives, and in any case the area through the tubes is not the only criterion of the resistance to the gas flow. The tube length will obviously affect this factor, and as locomotives have been designed in this country within the last few years with tubes as short as 12 ft. 4 in. and as long as 20 ft. 9 in. the effect of tube length cannot be neglected. Furthermore, a given total area through the tubes will afford freer flow to the gases if it is provided by large bore tubes than by a larger number of smaller tubes. It would seem as though there .is little help to be gained from the simpler arithmetical ratios of boiler heating surface to tractive effort, or area through tubes to grate area, and the author has attempted to develop a method of analysing and comparing boiler proportions and performance which, based on experimental results, may be expected to establish a rational order. The method adopted is to calculate the boiler output, efficiency and draught requirements over a range of firing rates by means of the Lawford Fry formulae, based on results from the American testing plants. This method of analysis has been applied to 22 British express locomotives of widely varying dates, types and sizes, and it is suggested that the resultant curves for boiler out- put plotted against draught requirements distinguish clearly between boilers known to have good steaming qualities and those of indifferent merit in this respect. It is even suggested that a formula connecting output with draught (when calculated in accordance with the methods suggested by the author) can be constructed to indicate whether a boiler design is or is not likely to be free-steaming in service. Brief consideration was also given to the effect of "over-cylindering" of locomotives and to some possibilities of increasing boiler output without sacrifice of efficiency. The Paris Exhibition. 344-7, 4 illus. The International Exhibition included full-size railway items from the Soviet Union: a Russian 2-8-4 Joseph Stalin, diesel and electric locomotives from Germany and Belgian rolling stock. A model of the Night Ferry train service from Victoria to Paris was popular and included loading the train onto the ferry. A complex model of the Metro system was also popular. Dynamometer tests on Midland & Northern Divisions, L.M.S.R. 347-8. 2-15 October 1937: No.5660 Rooke was tested on high-speed schedules on the routes radiating from Leeds to Bristol and Glasgow. The run from Carlisle to Ais Gill Summit (48.4 miles) was accomplished in 48 minutes 36 seconds . A modern crossing, Stockton and Darlington Section, L.N.E.R. 348-9. 2 illus. Former crossing on East Coast Main Line consisting of 24 intersections made from Era manganese supplied by Hadfields Ltd. Photographs show typical North Eastern Area tidy conditions (ballast in foreground is white) and one illustration shows crossing in close up and another with Silver Jubilee approaching. Phillipson, E.A. The steam locomotive in traffic. (b) Functions of running headquarters. 349-51. Ellis, C. Hamilton. Famous locomotive engineers. III Charles Beyer. 351-4.. Someone said of Handel that he was a German who composed Italian music to please the English people. It might be said in the same way of Charles Beyer that he was a German who designed English locomotives for people all over the world. His original nationality was Saxon. Saxony did not enter the North German Confederation until Bismark "worked" it in 1866. The legend, "Beyer, Peacock & Co., Manchester," during the last century became more than a mere proprietary name, it became a hallmark, and it remains a hall-mark to this day on railways all over the world. This sounds like advertising, which is by no means the object of these articles. Still, it is true, and Beyer deserves much of the credit for it. Charles Frederick Beyer, who began his career as Carl Freidrich, was born at Plauen Saxony, on May 14, 1813, being the son of a weaver. His father intended him to enter the same trade and apprenticed him for three years to a respectable colleague. Young Carl, however, though a conscientious weaver as far as we know, showed more proficiency as a draughtsman, and also as an artist, having a fine perception of beauty of line. He amused himself in his spare time by drawing buildings and other subjects. His mother saw in him a budding architect, and in his spare time he was allowed to learn and study mathematics. A drawing which he had done of a head came into the hands of Dr. von Seckendorf, who showed it to the District Officer of Education. The end of this was that young Carl Beyer, not entirely to his father's satisfaction, for the family was poor, was released from his apprenticeship, and sent to the Dresden Polytechnic. Hereafter followed four years of hard work and stern privation. Naturally there was no money forthcoming from his home. The State allowed him 30 thalers a year towards his education, and this sum, £4 10s. in terms of sterling, was exactly swallowed up by his fees. The balance for his living he had to make up by sundry odd jobs such as keeping books and preparing papers. For this he was paid at a rate equal to about 1d. an hour. He managed to live somehow, David Copperfield fashion. At the end of his four years, when he had honourably completed his initial training, Beyer got a position in Hanbold's machine shop at Chemnitz, where he was paid at the rate of six shillings a week during his first year and nine shillings a week during his second. At the end of that time, as a reward for good work, he received a State grant of £45 to travel to England and to report on mechanical improvements in the spinning of cotton. At Manchester, whither he went, he met Richard Roberts of Sharp, Roberts and Company. Roberts was the inventor of the self-acting spinning mule; he greatly influenced the young Beyer. His connection with this firm was destined to ripen into something more, for after he had returned to Dresden and received a somewhat unprincely reward for his research, he turned once again to Manchester. He did not find it easy to obtain a position with Sharp, Roberts & Co. The fact that he was a foreigner went against him with employees of the firm; his comparative ignorance of the English language was another stumbling block. Mr. Sharp is said to have offered him a sovereign to go elsewherequite kindly perhapsonly to be told by Beyer that it was work he wanted, not charity. Thus it was that Charles Beyer started as a junior draughtsman with Sharp, Roberts & Co. in 1834, under Richard Roberts' own eye. It was not long before Sharp, Roberts, previously engaged in the manufacture of machine tools, looms and spinning jennies, began to turn their attention towards the construction of locomotives. Roberts, who was the practical engineering man of the partnership, turned much of the mechanical engineering side over to Beyer when it came to locomotives, and this was the true beginning of the latter's professional career. Roberts had first dabbled in locomotive design as far back as 1832, but it was not until Beyer got into his true sphere, some years later, that the firm began to establish its long-standing reputation for sound engines. The celebrated "Sharp Standard" or "Sharpie" engine of the 'forties [1840s]  2-2-2 for passenger and 0-4-2 for goods trafficowed its origin to Beyer. Roberts had retired from the business by 1843, and for the next ten years Beyer is believed to have done all the designing of locomotives for Messrs. Sharp Bros., as the firm had then come to be known. The "Sharpies" must be regarded as Beyer's maiden work. None of them were big engines, but they enjoyed a considerable spell of popularity on various British railways. Some of those which the Great Northern managed to acquire just before Archibald Sturrock put his spoke in had very long lives indeed, surviving on the level Lincolnshire lines until well into the 'seventies [1870s]. Thirty years was an extremely long life during the middle decades of the nineteenth century. In 1844 the then King of Saxony, Friedrich-August II, visited England, and visited the Sharp works during his tour. He was agreeably surprised to find a young ex-subject of his in charge of the engines, and this may have had something to do with the introduction of Sharp locomotives. to Saxony soon after. One of the hall-marks of contemporary Sharp engines, the elegant brass. dome cover with its cornices, cupola and bell-mouth, appealed strongly to the contemporary German firms. It was extensively copied by such firms as Borsig of Berlin and Hartmann of Chemnitz. Beyer and Richard Hartmann were close friends from 1832 on. Much "developed" versions of the famous dome survived until the beginning of the nineteen thirties on the old Borsig engines in Holland. Mention of this dome reminds us that Beyer paid an extraordinary amount of attention to external appearance. His old architectural training came out here, and as a result he was to design, not only some of the best, but also some of the most beautiful engines of his time. Ugly lines he could not endure. He pulled a knob off his desk one day, and carried it into the drawing office, and requested one of his apprentices to draw him a pretty knob to replace the ugly one he held in his hand. The young fellow spent his whole dinner hour drawing knobs for Beyer, and having lost the opportunity for eating his own dinner, was afterwards dined by the chief as a reward. Turning back to things more important than knobs, it can be said quite safely that Beyer never designed an ugly locomotive. To this naturalised immigrant from Saxony British practice owes much of its reputation for graceful locomotives, for the Sharp-Beyer locomotive, with its bold outline, its balance, and its substantial plate frames became a model for other builders in England and Scotland. In 1853, two things happened at Sharp Bros. Works. Stewart joined them to form the firm of Sharp, Stewart & Co., and Beyer ,who had advanced a long way from his early status, left them. For several months he toured in Great Britain and abroad, returning at length to Manchester to enter into partnership with Richard Peacock, hitherto Locomotive Superintendent to the Manchester, Sheffield and Lincolnshire Railway. Together they founded the famous firm which still bears the names of Beyer and Peacock. Twelve acres of land beside the Sheffield line at Gorton were bought as a site for the works. The first brick was laid on March 14,1854, and on July 31, 1855, the works turned out their first locomotive. This was the first standard gauge engine of the Great Western, and was designed, as might be expected, by Daniel Gooch. It was not long, however, before the true Beyer designs began to appear from Gorton Foundry, and these, to the time of Beyer's death, were to be of many and varied types and unvaried quality. Notable among these, in the early years, were the famous 2-2-2 express engines for the Edinburgh and Glasgow Railway, with 6 ft. 6 in. driving wheels like the Great Western engine and flush-topped domeless boilers. The driving wheels only had inside bearings. They came out in 1856, when they were among the finest standard gauge express engines in the country. Though built to the requirements of Mr. Paton, the E. and G. Locomotive Superintendent at Cowlairs, the design was almost pure Beyer. Following previous experiments by Peacock, the blast-pipe orifice was placed a little above the top row of tubes. The life of these engines must constitute a record among Victorian locomotives. Wheatley fitted one or two with domed boilers in the 'seventies [1870s], and the rest were similarly dealt with by Dugald Drummond. On the North British, which had taken them over with the rest of the E. & G. plant, most of them survived until the early nineteen hundreds. In 1908, if not later, one could nearly always be seen at work on the Border Counties line between Hexham and Riccarton. The class was then 52 years old, a ripe age for a six-wheeled single. An even longer life has been enjoyed by another engine of the same general type, the Dom Luiz, built for the Portuguese South Eastern Railway in 1862, and shown at the Great Exhibition of that year. Dom Luiz, which had a raised steam space over the firebox instead of the usual flush top, was at work in Portugal at least as recently as 1927, if it is not there still. Beyer was one of the first to explode the low-centre-of-gravity theory, as can be seen from these early designs. On this matter he enjoyed to dispute with Joseph Beattie, who was a personal friend of his, and a comparison of Dom Luiz or one of the Edinburgh and Glasgow engines with Beattie's Crescent or Canute class on the London and South Western illustrates their two points of view very well. Of particular interest were the Beyer four-coupled tender and tank engines with leading Bissel trucks, the classical examples of which occurred on the London Underground lines and the Isle of Man Railway. But the first engines of this famous type appeared neither beneath London nor in Man. As far as I can ascertain the first of the 2-4-0 variety were built for the old Tudela and Bilbao Railway in 1862, which was laid to the Spanish broad gauge of 5 ft. 5¾ in. These had separate tenders, unlike later examples of the type, and inside bearings to the leading wheels. The outside inclined cylinders were directly over the leading axle, and the Bissel truck was controlled by inclined planes set to a grade of 1 in 11. The wheelbase was 18 feet, of which 10 feet lay between the leading and the driving wheels. In 1866 a tank variety appeared for the 3 ft. 6 in. gauge lines of the Norwegian State Railways between Trondhjem and Storen, and Harnar and Grundsett. This was the class which was modified to suit the 3 ft. gauge of the Isle of Man Railway in 1873. In both the Norwegian and the Manx engines, the coupled wheels were 3 ft. 9 in., the leading wheels 2 ft., and the wheelbase 8 ft. leading-to-driving and 6 ft. 3 in. driving-to-trailing. Similar engines were built for the Ballymena and Larne Railway, the Egyptian Delta lines, South Australia, and for other lines in Norway. They have remained the standard Isle of Man type to this day, the latest having been built in 1926. Boiler dimensions have, of course, been progressively enlarged, but the original Manx engines and some of the Norwegian engines are still doing good work, and the former still delight the eye with their pretty lines and their richness in polished brass and copper. They are Nos. 1 Sutherland, 2 Derby, and 3 Pender of the Isle of Man Railway Company. The design was afterwards elaborated by Beyer's compatriot, Hermann Lange, who succeeded him, and who produced six- coupled Bissel truck engines for Australian and South American lines. The ancestry of the larger 4-4-0 variety has been traced to an engine designed by J.C. Craven for the London, Brighton and South Coast, but the original Beyer engine, like the first 2-4-0, was built for the Tudela and Bilbao Railway in 1862. This was developed in the following year into the famous Metropolitan type. In the Metropolitan engines, the four-wheeled Bissel trucks were not entirely successful, and subsequent locomotives of the same class were turned out from Gorton with Adams bogies. The dome was placed on the first ring, as in old Sharp practice. They are too well-known to need an extended reference, and their final disappearance is only taking place at the time of writing. From 1864 to 1905, they worked practically all the London Underground trains on the Metropolitan and Metropolitan District Railways. Others were built for the South Western and Midland Companies. The last survivor is No. 23 of the Metropolitan series, built in 1866. Hermann Lange designed similar tender engines for New South Wales in the year of Beyer's death, and some of these are still running at the time of writing. Six of the Metropolitan engines subsequently worked on the Buxton line of the London and North Western. During the 'sixties [1860s] and 'seventies [1870s], Beyer's friendship with the Beatties seems to have resulted in a large number of heavy goods engines, of almost unadulterated Beyer design, being built for the London and South Western Railway. They were of three varieties, all of the 0-6-0 type. The oldest had double frames; then came the "345" class of the 'seventies [1870s], and finally there were the well-known "Saddlebacks"  0-6-0 tanks  two of which survive on the Kent and East Sussex and the East Kent Railways respectively. Examples from the same three classes appeared in various places, notably in Holland, while the 0-6-0 double-framed tender type was obviously copied at Derby and Wolverhampton, as well as being built by the parent firm for the G. W. and Midland lines. To-day the Bergslagen Ry. in Sweden can still muster one or two "Saddlebacks." Akin to these were the light "Ilfracombe" 0-6-0 tender locomotives for the L.S.W.R., which were also duplicated for service abroad. The Dutch State Railways, during the 'sixties [1860s] and 'seventies [1870s], enjoyed the cream of the Beyer express passenger engines. There were two out-standing Dutch classes during this period, both with inside frames, and the later series having outside cylinders. They survived until very recently on the Isle of Walcheren and in North Holland. Fifty of the outside cylinder type were built for the Dutch State Railways between 1872 and 1879, and they were still quite common when I visited the Netherlands in 1928. After Beyer's death, the Dutch State Railways went back to inside cylinders for subsequent 2-4-0 locomotives ordered from Beyer, Peacock & Co. in the classical double-framed engines designed by Hermann Lange. To this day, Holland and the Isle of Man still provide perfect fields for those who wish to study the "Beyer line." For this, we have to thank the succession of Lange, Beyer's old friend and colleague. Beyer had, however, designed 2-4-0 express engines with outside cylinders many years before this, as exemplified in the famous Wastergotland class, the first engines of the Swedish State Railways, built in 1856. These had domeless boilers. Also for the Swedish State Railways, some years after, Beyer designed the celebrated "Spinning-wheels," 2-2-2 express engines somewhat similar to those of the Edinburgh and Glasgow Railway but with domed boilers and inside bearings throughout. A Wastergotland (Prins August) and a "Spinning-wheel" (Gota) are both preserved in the railway museum at Tomteboda, outside Stockholm, whither even the British student must now go in order to see an English-built express engine of the 'fifties [1850s]. The locomotives mentioned form but a fraction of all those designed by Charles Beyer for the world's railways, but they must be taken as exemplary. Turning back to the life of Beyer, it might be said that in all his life he had but two loves. The first was Sharp's daughter, whom he courted in vain. The other was the Gorton Foundry, to which he devoted all his energy and interest for the rest of his life. Even in his last years, when he had nominally retired to the beautiful surroundings of his country house of Llantisilio Hall, Llangollen, he was actually seldom out of ear-shot of Gorton. Though surrounded, at Llantisilio, with the potential "delights" of the field, he en- joyed rearing animals more than killing them. A strong-minded bachelor, he was something of a "character," with his tall stature, his domed, high forehead, luminous blue eyes and rather straggly beard. Men feared, respected and loved him. Nobody was quicker to encourage and befriend the good worker, nobody more down on the mal- inger, the clock-watching idler, or the sycophant. The tremendous energy of this man, possibly coupled with the intense privations of his early youth, took their toll, for he died at the age of 63 at Llantisilio, on June 2, 1876, just after he had built the new house there. He was perhaps a truly God-fearing man during an era when conventional and exhibitionist religion was exceedingly fashionable. All his bequests were deserved. Neither the miserably paid country parson nor the hard-working draughtsman at Gorton was forgotten. The Manchester College of Technology and the Beyer Laboratories of the University owed their origin to Beyer's will. But another great institution owes its existence largely to Beyer's enthusiasm in his earlier years. In 1847 he held a meeting at his house in Manchester which resulted in the foundation of the Institute of Mechanical Engineers. George Stephenson was elected President, while Beyer, J.E. McConnell of the North Western, and Joseph Miller were the first Vice-Presidents. One other story of Beyer's generosity deserves repetition. Old Roberts, the object of his first hero worship, sometime of Sharp, Roberts & Co., became a man of lost prosperitv in his latter years. Beyer did not consider for a moment that he was doing any kind of a favour in providing straight-away for the comfort of his former adviser and employer. Illustrations: C.F. Beyer in "his later years" (portrait); Isle of Man Railway 2-4-0T No. 3 Pender; 4-4-0 tank locomotive No. 48 Fuenmayor Tudela & Bilbao Railway, Spain, built 1862 and 2-2-2 locomotive No. 37 Blixten (Lightning) Swedish State Rys. Continued from page 292. (6) The "Atlantics," Class H1. Some time before the last illness which culminated in his death, Mr. Robert Billinton had roughed out a design for an exceptionally handsome 4-6-0, which would have had 20 by 26 in. cylmders, 6 ft. 9 in. driving wheels, and 200 lb. working pressure, and would have been, in its general lines, an extension of his "B4" class. The design was never brought to the practical stage, firstly, because its author passed away in the meantime, and, secondly, because Mr. Marsh hailed from Doncaster Works, so that it was a foregone conclusion that he would import into the locomotive stock of his new company the very successful design of Atlantics that Mr. H. A. Ivatt had lately introduced upon the Great Northern Railway. To quote the Railway Engineer of May 1906, the principle of the H1 class engine was "to mount a large and effective type of boiler on as short a total wheelbase as possible." The five engines of class H1 had been rebuilt to suit the composite load gauge, the first so converted having been No. 2038 in June, 1935, and the last No. 2037 in May, 1936. The alterations carried out at Eastleigh Works involved fitting parallel cast-iron chimneys, of the U1 pattern, the flattening of the domes by 45/16 in., the provision of a new standard cab roof, with rounded eaves, the replacement of the Brighton whistle by one of Drummond type, and its removal from the cab roof to a place on the firebox shell, alongside the valve casing, and the insetting of the footsteps. The levers of the Ramsbottom safety valves, which formerly passed through slits in the weatherboard, have been considerably shortened, .and are now beyond the normal reach of the enginemen. The original tall lamp irons have been replaced by two series, one on the buffer beam, the .other half way up the smokebox door. The Westinghouse hoses have been removed, and the train pipe sealed at both ends, but the air brake is retained for the engine, acting in conjunction with the vacuum brake on the train. The HI class was fitted with an H2 class smokebox, resting upon a saddle. The illustration also shows the rail de-sander (a diagonal pipe between the driving and the trailing wheels), which delivers hot water to the rails to clear them of grease, etc. and so maintain good electrical conductivity for the track circuit, and on the left- hand top slope of the smokebox will be noted a screwed connection to which tube blowing lances are attached, by means of flexible piping, in order to dean the tubes by steam, at the end of the day's work. All the main line engines, freight and passenger, of Central Section were receiving these fittings as they passed through the shops. (7) The Atlantics, Class H2. The later series were receiving similar alteratiions at the time this part was being written. Conversion of a railway to a road. C.B. Branston. Notes how H.M. Flagler developed Florida as a winter resort and extended the Florida East Coast Railroad to Key West by a series of bridges with a swing drawbridge across the Moser Channel. The traffic consisted of a mail train running during the day. The letter writer travelled on the line in 1913 when the stations on the mainland were still draped in crepe to mark Flagler's death. Other railways converted to highways included the Colorado Midland RR which crossed the Continental Divide at 11,500 ft in the Hagermann Tunnel: the Midland Highway includes th two-mile long Busk Tunnel. Reed, K.H. and Fayle, H. Recent developments of Irish locomotive practice, Great Southern Railways. 360-1. Continued from page 311. The 0-6-0 goods engine types: there were over fifty engines included in the "Standard Goods" class in 1925, but some of these were older locomotives that had been rebuilt and standardised at various dates. This type had cylinders 18 in. by 24 in., coupled wheels 5 ft. 3 in., and wheelbase 14 ft. 11 in. Most of them had been rebuilt by the M.G.W.R. with Belpaire boilers, barrel 9 ft. 8 in. by 4 ft. 5 in., 206 tubes of 1¾ in., heating surface, 938 (tubes), plus 115 (F.B. ); total 1,053 sq. ft.; grate area 16 sq. ft.; weight of engine 40¼ tons in working order. The G.S.R. numbers ran from 563 to 613, but sixteen (Nos. 563-6, 568-73, 577-81, and 611) have since been scrapped. The remainder have been variously rebuilt, and those running with the M.G.W. up-turned cabs have had others fitted of Inchicore pattern. No. 591 and 593 have been fitted with G.S.W. standard goods ("101" class) boiler with round firebox. The following have been rebuilt since 1931 with class "X" superheater Belpaire boiler (see class "52") and extended smokebox: Nos. 576,582, 583, 590, 594, 595, 596, 597, 599, 601, 602, 604, 605, 606, 607, 608, 609 and 610. (Fig. 17). One engine of this class, No. 567, has been provided with a special boiler made by shortening the Belpaire boiler from an engine of class "C" (4-4-0); it is fitted with 8 in. piston valves, the cylinder dimensions being unaltered, and has the centre line pitched 8 ft. 0 in. above rail level. A new cab of Great Northern Railway (Ireland) type has been provided, and later on, an Inchicore pattern funnel. Another class of goods engine is represented by four locomotives built by the Avonside Engine Co. in 1880. Originally built for the Waterford, Dungarvan and Lismore Railway, that company was unable to take delivery, so the four engines were bought by the Midland Great 'Western Railway and numbered 96 to 99. In 1908 they were completely rebuilt at Broadstone with Belpaire boilers, similar to those on class "A" 4-4-0, but with sloping grates owing to the short wheelbase. In 1919 they were provided with 18 element superheaters, the boiler centre being raised to 8 ft. 0 in. to glve clearance for 8 in. piston valves, They are amongst the most useful medium sized goods engines on the Great Southern Railway, and now bear the numbers 619 to 622 and classification J6. The dimensions are: cylinders 18 in. by 24 in., coupled wheels 4 ft. 9 m., wheelbase 15 ft. 0 in., boiler 11 ft. 0 in. by 4 ft. 10 in., grate area 20 sq. ft. Heating surface 832 (tubes), plus 172 (S.H. ), plus. 116 (S.H. ); total .1,120 sq. ft.; weight of engme 45 tons 12 cwt. m working order. The tenders hold 3,000 gallons of water and weigh 35 tons 15 cwt., having been removed from class "A." Nos. 619 and 622 have since been fitted with the new" H " class boiler. (Fig. 18). The class "B" goods engine, four of which were built by the North British Locomotive Co. in 1904, were numbered 143 to 146 on the M.G.W.R., and became 646 to 649 on the G.S.R. in 1925, being classified "J 2." Since they were described in the LOCOMOTIVE in 1906, they were all rebuilt in 1917-19 with superheater Belpaire boiler and extended smokebox, having the same dimensions as that fitted to Class "A" 4-4-0. The centre line is 8 ft. 9¼ in. above rail level and the heating surface 842 (tubes), plus 170 (S.H. ), plus 150 (F.B. ), total 1,162 sq. ft. The weight of the engine is 47 tons 4 cwt. in working order. The other dimensions are: cylinders 18 in. by 26 in., coupled wheels 5 ft. 3 in., wheelbase 16 ft. 3 in. Two engines of this class, Nos. 646 and 647, have recently been withdrawn from service. The twenty-three engines of class "F," 0-6-0, built at Broadstone and by Armstrong, Whitworth and Co. in 1921 to 1924, have already been noticed in these columns; they are all running unaltered, and now bear the numbers 623 to 645 on the G.S.R. and the classification "J 5." It may be noted that the cylinders are 19 in. by 26 in., and the coupled wheels 5 ft. 8 in. diameter, the engines being intended for both goods and passenger service; all are still working on the M. G. W. section. The Midland Great Western Railway purchased two 0-6-0 locomotives from the makers, Kitson & Co., in 1900, that were intended for the Waterford, Limerick and Western Railway, but were not taken by that line owing to its amalgamation with the Great Southern and Western Railway. These were exactly similar to the standard goods class on the W.L.W.R., and had cylinders 17 in. by 24 in. and 5 ft. 2 in. coupled wheels. The wheelbase was 15 ft. 9 in., heating surface 'tubes) 873.2, plus 108 (F.B. ), total 981.2 sq. ft., grate area 17.8 sq. ft., and the weight of the engine 41 tons 4 cwt. in working order. The engines became Nos. 141 and 142 on the M. G. W .R., and the cylinders were later enlarged to 18 in. by 24 in. In 1925 they became 233 and 234 on the G.S.R., being classed "J 17"; No. 233 has since been scrapped. There were two classes of tank engines on the M.G.W.R. both with six coupled wheels and side tanks; the largest, known as class "P," was built for shunting at Northwall goods yard, Dublin, and bore numbers 100 to 103 and 105. All were rebuilt in 1900 to 1903 with Belpaire boiler similar to that fitted to the standard goods engine. In 1925 the G. S. R. renumbered the engines 614 to 618 with the classification "J 10." No. 614 was again rebuilt in 1931 with a saturated round topped boiler. The dimensions are: cylinders 18 m. by 24 in., wheels 4 ft. 6 in., wheelbase 14 ft. 11 in., tanks 1,000 gallons, weight 44 tons 19 cwt. in working order. The twelve 0-6-0 passenger tank engines were classed "E," and bore M.G.W. numbers 106 to 117. They were built by Sharp, Stewart and Kitson between 1890 and 1893. All these have been provided with larger boilers and are still at work. The dimensions are: cylinders 15 in. by 22 in., wheels 4 ft. 6 in. diameter, wheelbase 13 ft. 3 in., heating s-urface 509 (tubes), plus 72 (F.B. ), total 581 sq. ft.; centre line 6 ft. 3 in. above rail level; tanks 700 gallons; weight 33 tons 12 cwt. in working order. This very useful class is employed all over the system, and now bears numbers 551 to 562 and classification J 26. Two of them, Nos. 555 and 560 have been transferred to the Waterford and Tramore section. Illustrations: Fig. 17. 0-6-0 goods engine, No. 595, rebuilt with "X" type boiler, Great Southern Rys. Fig. 18. 0-6-0 goods engine No. 619, with "H" type boiler, Great Southern Railways. Light-weight railcar design. 361-3. 3 illus. Wickham & Co. of Ware designs including one for the Central Railway of Peru. At the general meeting held on 27 October, the following were elected:- Member: M. M. Loubser, Acting C.M.E., South African Rail- ways and Harbours, Pretoria. Transfer from Associate Member to Member: W. L. Topham, Chief of Water Utilisation Section, F.C. Sud, Remedios de Escalada, Argentina. Associate Members: V. F. Dittrich, Draughtsman, Birmingham Carriage and Wagon Co., Ltd., Smethwick, Staffs. H. J. A. Lockeridge, Assistant Engineer (Designing), New South Wales Govt. Railways, 19 York Street, Sydney, N.S.W. W. Raynes, Mechanical Inspector, Western Australian Govt. Rys., Midland Junc., W.A. Associates: L. B. Edwards, Manager for India, the Baldwin Loco. Works of Philadelphia, 5 Dalhousie Square, Calcutta. J. Fox, Engineer- Director, Clause and Co. Ltd. (Dacre House, Victoria St., S.W.l) ; Devon and Courtnay Clay Co., Ltd., etc. F. Mason, Partner, Davis and Lloyd, 26 Victoria Street, S.W.l. The following staff appointments had been approved by the Directors of the L.M.S.Ry. : Mr. E. S. Cox, Development Assistant, .C.M.E. Dept., Derby, to be Personal and Technical Assistant to the Chief Mechanical Engineer, Euston. Mr. D. W. Sanford, Chief Loco. Draughtsman, C.M.E. Dept., Derby, to be Development Assistant, C.M.E. Dept., Derby. Mr. A. E. Owen, Assistant Chief Locomotive Draughtsman, C.M.E. Dept., Derby, to be Chief Locomotive Draughtsman C.M.E. Dept., Derby. Mr. R. Hutchison, Running Inspector, Operating Manager's Office, Glasgow, to be Assistant District Locomotive Superintendent, Polmadie. New Post Office sorting vans, L.M.S. Railway. 364-5. Stanier-dessigned vehicles built at Wolverton. Interior painted a "special shade of green to avoid eye-strain"
Transfer of the Metropolitan Line steam services to the L.N.E.R. 365. On November 1 1937 the steam locomotives and goods wagons of the Metropolitan line of the London Transport Board were transferred to the L.N.E.R. In futurc the steam trains on that line, as well as the goods traffic to Watford , Chesham and Aylesbury, are to be operated by the L.N.E.R. The Metropolitan locos. taken oyer comprise the four 0-4-4 tanks [sic: 0-6-4T] Nos. 94 Lord Aberconway, 95 Robert H. Selbie, 96 Charles Jones, and 97 Brill; eight 4-4-4 tanks, Nos. 103 to 110, and six 2-6-4 tanks, Nos. 111 to 116. The remaining steam locomotives, comprising one 4-4-0, four 0-4-4, four 0-6-2, and two 0-6-0 tanks will still be used by the Transport Board for ballast duties, or sold. Electrification of the Metropolitan and Great Central Joint line between Rickrnansworth and Chesham and Amersham is to be expedited. At the Railway Club meeting held on Thursday, 4 Nov. at the Royal Scottish Corporation Hall, Fetter Lane, Mr. V. S. Haram read an interesting and constructive paper entitled  Some Suggested Economies and Passenger Train Services On the L.M.S.Ry." Dividing his schemes into two parts, the first concerned solely with the L.M.S. and the second required co-operation with other companies, Mr. Haram stressed the lack of facilities between the Western and Midland divisions, and outlined schemes to connect Watford with Luton and Luton with the Birmingham district including improved connections at Hemel Hempstead, Bedford and Northampton. Improved services for Buxton and Skipton werc also suggested. In the second part of the paper, schemes were described for improvements at Victoria Park enabling. L.N.E.R. Fenchurch Street trains to use Broad Street; at Peterborough abolishing the East Station and enabling Midland division local stations to be served by L.N.E.R. trains; at Stamford closing the L.N.E.R. station and using the existing branch to the L.M.S. station; and similarly at Nottingham, Micklc Trafford, Macclcsfield, Appleby and Worcester. Mr. Harnm illustrated his remarks with an excellent series of diagrams, for which he acknowledged the assistance of the Hon. Librarian, Mr. H. W. Bardsley. Derens, L. The Dutch State Railways Company. 365-7. 2 illus., table. Table lists the 54 locomotives and 17 tram engines taken over from the Rhenish Railway on 14 October 1890 (all were fully described in Locomotive, 1920). Two further former Rhenish Railway locomotives illustrated: Fig. 47 shows 2-2-2T No. 38 (SS No. 1038) rebuilt in 1869-73 from tender engines at Utrecht, and Fig. 48 shows 2-4-0T No. 72 in original condition. E.S. Tiddeman, Death on 14 October 1937, formerly chief draughtsman of the locomotive department of the Great Eastern Railway. Starting as a pupil of T.W. WorsdeIl in 1882 he obtained the usual shop and drawing office training, and later became assistant in the millwright shop. He was transferred to the drawing office in 1890 and .in 1907 succeeded W.D. Craig as chief draughtsman from which position he retired in 1926. Mr. Tiddeman was responsible for several inventions including a water level indicator and a spark arrester for locomotives, as well as a train control system. Thos. Powell, W,e regret to learn of the death of Mr. who was for many years Secretary and Manager of the Pullman Car Company. He passed away at Bournemouth on Nov. 9 after a long mness. Early Eastern Counties locomotives. 367-9. 6 diagrs. (s. els. ), table. Continued from page 298 (August): In referring to the engines built by Jones and Potts in our August issue it should have been mentioned that No. 97 was also altered like No. 94, which was broken up in Feb. 1857. In Mr. Battley's collection was a sketch of No. 203, a small 2-4-0 closely resembling in its original state Nos. 170 and 171, but without the moulding below the domed top of the firebox. The safety valve levers were placed at an angle so that the spring-balances were at the right hand side of the firebox just forward of the weatherboard, the top of which was turned over for about a foot. On the boiler just below the handrail and above the driving splasher, are the words "Ballast Engine." Below the sketch is the note, "Painted red." This was evidently one of nine engines built by Jones and Potts in 1845-6; below is a summary of these in tabular form. A ninth engine of the same class was received in March 1846 but was immediately transferred to the Norfolk Railway, by whom it was numbered 12, the E.C.R. receiving in exchange, in March 1846, a six-coupled goods engine built by Tayleur and Co., their No. 244, for the Norfolk Railway. The tenth engine was then numbered 49. On the taking over of the locomotive stock of the Norfolk Rly. by the Eastern Counties Rly., the goods engine was numbered 91 and later 150. No. 203 was rebuilt similarly to Nos. 170 and 171 described in our August issue. No. 182 also differed from 81 inasmuch as the former is said to have been supplied with wrought iron wheels at an additional cost of £44. From the practice of the builders at the time they were constructed, it is probable that those wheels had forged rims and spokes, the bosses being cast in. Fig. 28 shows this engine as built; Fig. 29 as modified by Gooch, and Fig. 30 as rebuilt. Figurres: Fig. 26. 2-4-0 exgine, No. 79 E.C.R. ; Fig. 27. 2-4-0 tender loco. as modified, No. 81, E.C.R. ; Fig. 29. 2-4-0 tender engine No. 182, E.C.R. as modified; Fig. 30. rebuilt 2-4-0 engine, No. 182A, E.C.R. Diesel locomotives for China. 369. illus. 0-4-0 for 2 ft gauge built in China; designed by R.G. Morrison.and fitted with a National 2 B.S. Diesel engine capable of developing 12 b.h. p. at 1,000 r. p.m.
Obstruction-danger: stories of memorable railway disasters, by John Thomas. Edinburgh and London: William Blackwood and Sons, Ltd. 276 pages. The railway age by Cyril B. Andrews. London: Country Life Ltd. The Crown Agents for the Colonies have placed an order with Beyer, Peacock and Go. Ltd. - for seven 4-6-2 type passenger locomotives for the Gold Coast Government Railways. The South African Railways Administra·tion has placed orders for 45 locomotives of the 4-8-2 type, Class "19C." Twenty-three of these will be built by Krupps of Essen and 22 by the Borsig Works of Berlin. In our last. issue we announced that the Metropolitan-Vickers Electrical Company had received from the South African Government an order for twenty-two 1,200 horse-power 66 ton 3,000 volt electric locomotives. This order has now. been increased by the addition of twenty further locomotives, the total cost for the forty-two locomotives exceeding £500,000. These locomotives are for service on the Natal Railway and have been made necessary by increased traffic and by extensions of the electrified sections which now total 383 route miles and 634 track miles, the latest extension completing a through connection from Durban to Volksrust, which is approximately 140 miles from Johannesburg. The new locomotives will be similar to 120 Metrovick locomotives supplied previously. Whitelegg and Roger; Ltd. have received orders from the Crown Agents for the Colonies for the supply of eight engine sets" Ajax" axlebox lubricators and other equipment for the conversion of 2-8-2 and 4-8-2 type locomotives of the Nigerian Railway from oil to grease lubrication. Six engine sets of "Ajax" grease lubricating equipment for new 0-8-0 type locomotives for the King Kan Railway, under construction by the North British Locomotive Co. Ltd., and also eight engine sets of "Ajax" lubricating equipment for converting locomotives of the Buenos Aires Western Railway from oil to grease lubrication. The Mond Nickel Co. Ltd. of Thames House, Millbank, S.W.1, has issued a new publication, "Heat Resisting Steels," by Sir Robert Hadfield, Bt., F.R.S. The author traces the development of these materials and describes a few steels characteristic of modern applications. Their properties and applications are dealt with and the text forms a handy collation of information likely to prove of interest and use to engineers. From the figures given it will be seen that steels are now available which possess a strength at high temperatures at least ten times that of ordinary carbon steel or cast-iro n, Interesting applications illustrated include firehole door flaps for L.N.E.R. locos., tube plate supports, heads of Diesel engine valves, boiler fittings, etc. The L.N.E.R. have placed contracts with Cowans, Sheldon and Co. Ltd. for three 70-ft. turntables to be installed at London (Marylebone), Leicester and Darlington Locomotive Depots. The new turntables at Marylebone and Leicester will enable larger engines to be used on the Great Central Section Main Line, whilst the new turntable at Darlington will accommodate the large streamlined "Pacific" engines which are now used on the East Coast route expresses. The L.N E.R. have also placed a contract with H. Lees and Co. Ltd. of Glasgow for a 250-ton coaling plant to be installed at Darlington Locomotive Depot, and another with ·the Economical Boiler Washing Co. Ltd. of Westminster, for a hot water boiler washing plant to be installed at King's Cross Locomotive Depot. V.M. Barrington-Ward paper Modern developments in railway operating practice presented to Institute of Transport meeting in November. Crritical of extensive use of third rail in Southern Railway extensions towards Coast; notes the growth of London Tube network, but wondered if New York model of fast and slow lines shouln not have been followed. Excursion traffic copuld compete with motor coach if special stock was provided with restaurant cars capable of serving 240 meals.Buffet cars and third class sleeping cars were other innovations. Lomg through locomotive workings reduced costs.The abundance of coal was a major advantage over oil. Built by Thunes Mekaniske Vaerksted of Oslo: 4-cylinder compound. The leading radial truck was coupled to the leading coupled axle. Double chimney. New 4-6-0 engines completed at Swindon during October were Nos 6843 Poulton Grange, 6844 Penhydd Grange, 6845 Powiland Grange, 6846 Ruckley Grange, 6847 Tidmarsh Grange, 6848 Toddington Grange, 6849 Walton Grange 6850 Cleeve Grange. Nos. 3744-9 were new 0-6-0 tanks and No. 3215, 4-4-0 tender engine. Engines taken out of stock were Nos. 1235 and 1951, 0-6-0 tanks, No. 3282, 4-4-0 tender, and Nos. 4343, 4389 and 8301, 2-6-0 tender engines. The names selected for ten new "Hall" class engines, and also for the next fifteen of the "Castle" class, on which are utilized names which were removed from other engines to give place to "Earls," are as follows : Nos. 5976 Ashwicke Hall, 5977 Beckford Hall, 5978 Bodinnick Hall, 5979 Cruckton Hall, 5980 Dingley Hall, 5981 Frensham Hall, 5982 Harrington Hall, 5983 Henley Hall, 5984 Linden Hall, 5985 Mostyn Hall. Nos. 5068 Beverston Castle, 5069 Barbury Castle, 5070 Bridgwater Castle, 5071 Clifford Castle, 5072 Compton Castle, 5073 Cranbrook Castle, 5074 Denbigh Castle, 5075 Devizes Castle, 5076 Drysllwyn Castle, 5077 Eastnor Castle, 5078 Lamphey Castle, 5079 Lydford Castle, 5080 Ogmore Castle, 5081 Penrice Cattle, 5082 Powis Castle. Death of Sir Seymour Tritton on the 21 November 1937 aged 75. After his training at the Newcastle works of R. and W. Hawthorn, he went to India as assistant locomotive supt. of the Bengal and North Western Railway, subsequently entering the service of the Eastern Bengal Railway. When he returned to Britain he joined the staff of Sir Alexander M. Rendel, consulting engineer to the Indian State Railways, and many other undertakings, and later became a partner in the firm. During WW1, Rendel, Palmer and Tritton were consulting engineers to the War Office and the Ministry of Munitions for railway work of all kinds. Sir Seymour Tritton was a past president of the Institution of Locomotive Engineers, and was M.Inst.C.E., M.I.Mech.E., M.I.N.A., and in 1918 was created K.B.E. G.W.R. 4-6-0 locomotive "Manorbier Castle". 376. illus. 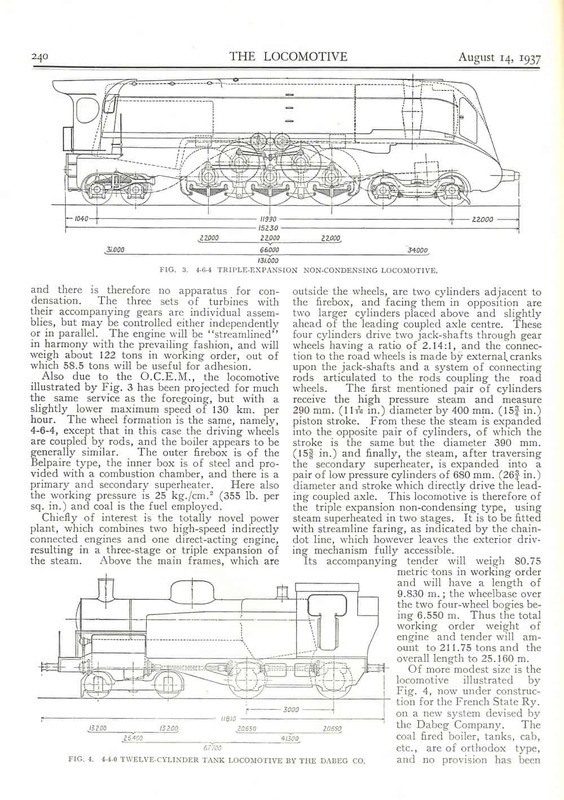 Illustration shows streamlined locomotive: paragraph noted why it was removed. Streamlining is really only effective for speeds of over 70 m.p.h., and then it largely depends on the direction of the wind. The Great Western main line suffers badly from side winds, and for that reason they only partially streamlined their locomotives, as any increase in the broad-side surface would be detrimental. They have found that even the fitting of a valance to the lower part of the carriage under the footboard is detrimental. It is not intended at present to streamline any more of the G.W. locomotives for no saving has been detected, but in many cases the coal consumption and oil consumption had been increased. The boxing in of the motion retains the heat and makes the oil thinner so that it runs away more quickly, and it is not desirable to make different grades of mixtures for different engines. It had been decided to extend electrification from Gravesend to Maidstone West, Swanley to Gillingham, and Strood to Rochester, as well as from Otford to Maidstone East ; the work scheduled to be completed by 1940. Colour light signalling to be installed at Victoria Station. Electrification from Virginia Water to Reading, Ascot to Ash Vale, and Aldershot Town to Guildford was due to be completed by January 1939, and work was progressing on the Portsmouth-Horsham coastal line to West Worthing, via Littlehampton and Bognor, and this scheme will be ready in July next. In the London area the number of trains a year has increased from 1,700,638 in 1924 to 2,483,701 in 1936. It is expected before long to put into service an electric locomotive. Built Beyer Peacock & Co. Ltd for 3ft gauge: 4-6-2+2-6-4. Institution of Locomotive enineers. The hammer-blow with axle-hung electric traction motors. 382-3. The meeting held at the Hall of the Institu-tion of Mechanical Engineers on Nov. 24, Mr. H. G. McLean, member, read a paper on " The Hammer-blow with Axle-hung Electric Traction Motors." The President, Lt.-Col. F. R. Collins, D.S.O., was in the chair. In the drive arrangement of the so-called "axle-hung" type traction motor, the motor is suspended partly by bearings frigidly fixed on the axle and partly from a nose or projection, on the side of the motor frame remote from the axle, through springs on to the truck or vehicle frame. The motor mass is, therefore, only partially spring-borne, some of the mass being rigidly associated with the wheels and axles. With this type of drive and suspension, therefore, blows occur on the track at irregularites such as rail joints or crossings. It has been assumed that this blow effect severely limits the field of application for this drive and alternative types of more complicated and more expensive and less robust drives have been developed for high-speed electric locomotives. With the increasing adoption of high-speed motor coach trains, where the motors had to be accommodated below the coach floor, and also in the application of electric transmission to Diesel vehicles, where the engine occupied the space above the floor level, it was, in general, impossible to adopt the newer and alternative types of flexible drive and there has been a strong tendency to retain the axle-hung motor. The author, in his paper, proceeded to review the investigations which have been made of the vertical hammer-blow effects on the track by the axle-hung motor arrangement and to indicate the approximate limits to its successful application. It is clear that the lateral blow with this motor is of equal importance and may be the limit to the ap-plication of this type of drive. In considering the vertical blow effect two problems are involved. The first is the determination of the blow which occurs at a track irregularity, such as a rail joint, due to the passage of a single axle load consisting partly of sprung and partly of unsprung mass. This blow will normally be determinable in terms of the mass, wheel diameter and speed. The second problem is to determine what portion of the total mass may be considered as unsprung-borne in respect of the blows on the track. Several solutions of both problems have been suggested, but no attempt has been made to con-sider the complete or dual problem. The author reviewed previous investigations in order to determine, where the axle-hung motor drive is adopted, what portion of the total motor mass should be considered as unspringborne in relation to blows on the track. A main formula is then derived expressing the complete hammer-blows in terms of the total unsprung mass per axle, including the equivalent unsprung mass of the motor, the vehicle speed, and the wheel diameter. E.A. Phillipson. The steam locomotive in traffic. 383-6. The possession of exhaustive data on train loadings and timings is essential. Unless a dynamometer car is available the only method of securing the necessary information is by actual trial. This procedure is slow, costly, and otherwise unsatisfactory; the desired results are obtained more quickly and more accurately with a dynamometer car in use. When it is desired to accelerate the running of any train, an elementary calculation only is necessary to prove that more journey time is saved by a given increment of speed in the lower ranges than by the same increment in high ranges. The desired acceleration is therefore most effectively secured by running at sustained high speeds on up gradients and not by the attainment of excessive peak speeds on down gradients; the object must therefore be to equalise, as closely as is practicable, the average drawbar horse power exerted over each timing section of the journey, and in this connection a dynamometer car is essential. Modern crank axle design. 386-90. diagram, 4 tables. L. Derens. Rhenish Railway, broad gauge locomotives. 395-6. Speedometers on the G.W.R. 399. Extension of programme to Saint and Star classes. Notes how the measuring device was protected from vibration by Sorbo rubber blocks. Naming cermeony of No. 4498 Sir Nigel Gresley with key of those who were present: W. Massey (Gresley's former Chief Clerk); Harry Harper, Gresley's Chief Clerk; Bert Spencer; G.A. Musgrave (Locomotive Running Superintendent, Scotland); behind and not named in caption George Dow? ; W.B. Brown, Carriage & Wagon Works Manager, York; D.R. Edge; A.H. Peppercorn; F. Wintour; Gresley; R.A. Thom; O.V.S. Bulleid; H. Broughton; F.H. Eggleshaw; Edward Thompson; T.A. Street. KPJ considers that KPJ's father (Frank Jones) may be behind "Dow" near Gresley's clerks and acting as "bag-carrier" for someone just out of the picture. Gresley was holding a silver model of the locomotive. 15 in. gauge line shows that in common with the large groups it is enjoying a considerable increase in traffic. The passenger traffic is largely obtained from excursions run by the L.M.S. Company, some of which operate from as far away as Blackpool. These trains after unloading their passengers at Ravenglass are backed into a siding while the excursionists travel up the miniature line to Dalegarth, where a short stop is made before returning to Ravenglass. The R. and E. trains in connection with these L.M.S. trains usually run without stopping at intermediate stations. The only halt made on the way up to Dalegarth is not far from Beckfoot for the purpose of taking water. The water "tank" consists of the body of a discarded steel stone wagon! It was noted that in spite of the hard climbing involved, on every trip the fire was only made up once. about half-way up. The fuel employed is coke and the engines seem to steam very freely. The passenger service was worked this summer by River Irt, an 0-8-2 and River Esk of the 2-8-2 wheel arrangement. On days when the traffic was heavy an 0-4-4 locomotive powered by a Ford engine of 22 h.p. was employed, although normally this engine appears to be kept for the stone traffic. The stone output from the crushing plant at Murthwaite is now largely taken down to Ravenglass in standard gauge wagons. This has been rendered possible by laying a 4 ft. 8½in. gauge track as far as the crushing plant. The 15 in. gauge line is laid in the middle and the rails of this are spiked to the sleepers of the larger gauge line. The full-size wagons are worked by a 6-wheeled internal combustion engined locomotive built by Kerr, Stuart & Co. Four of the wheels are coupled by sprockets fixed on the outside faces of the wheel centres and connected by a roller chain. It is of interest to note that the coupled wheels and cylinders formerly under the tender of River Esk (see LOCOMOTIVE, p. 291, 1928) have been removed and River Mite is laid up in the sheds apparently awaiting removal of the coupled wheels and cylinders and their replacement by two four-wheeled bogies, as in the case of the River Esk. The writer does not know why this conversion has been carried out, but surmises that as the tender would be nearly empty when some of the hardest climbing is encountered on the way to Dalegarth the engines under the tenders lacked adhesion when most required. The loads handled are, having regard to the profile and curvature of the line, very heavy. The locomotives are well kept and the line generally is conducted in a most efficient manner. It is however rather surprising that continuous brakes are not fitted on the coaches. The wear-resistance of nickel cast iron well exemplified by report issued by the New York, New Haven and Hartford Railroad. In 1935 they put into service a three-car Diesel-electric train, the Comet, the service of which differed from that of most high-speed trains in that it comprised a fast shuttle service between Boston and Providence, a distance of only 44 miles. The condition of the train after a year's service, and its service during that period, indicate the economy of this type of stock. Replacement costs are low and no delays due to engine trouble had been booked against the train. In referring to the service behaviour of the respective components during the first year of service, the following statement is made :"Centrifugally cast nickel-iron is used for the cylinder liners, and the limit of life is governed by the wear at the top of the piston ring travel. The maximum diametrical wear allowance before scrapping recommended by the Westinghouse Company is 0.075 in., but after 139,000 miles the average wear at this point on the two engines of the Comet was 0.0185 in., indicating that a life of about 500,000 miles may be expected. Mr. W.G. Wilson, A.M.I.Mech.E., M I.Loco.E., has been appointed chief mechanical engineer, Nigerian Rys. After serving as an apprentice with A. Barclay, Sons & Co. Ltd. of Kilmarnock, for five years, spending the last year in the drawing office, Mr Wilson was appointed assistant works manager. After serving in the Army, he returned to Barclays until 1920, when he was placed in the expenditure control department of Sir W. G. Armstrong, Whitworth & Co. Ltd. In November 1923 he was appointed assistant locomotive officer of the Nigerian Rys., as assistant works manager of the shops at Ebute Metta. In 1925 he became works manager and in 1929 assistant chief mechanical engineer. Weesterpoort station in Amsterdam; built in 1843 for the Rjhenish Railway, then a broad gauge line. The terminal buildings were not at the end of the tracks as in terminal stations, but alongside, so that the train shed is open on both ends. The locomotives of long trains pull up outside the roof, near the buffer stops, which stand practically in the street. Our picture shows a goods train on the third platform. The engine is a 0-6-0 of the former Holland Railway, built by the Werkspoor Co. in 1904, now No. 3239 of the Netherland Railways. This type was described in issue of July 1935. The small roof next to the train shed is built over the cabyard, which has been arranged conveniently there, as the station building on this side does not extend the full length of the train shed. The large building .in the background is the well known Arnstel Brewerv. Next 'year with the bcginning of the summer train service, the electrifioation of the line from Amsterdam to Arnhem via Utrecht w.ill be inaugurated. The future Amstelstation, the name of the new through station which is to take the place of the Weesperpoort stanion as a part of the relaying plan of the belt of railways round the city on a high level to clear the street traffic, will not be ready then. It is necessary therefore to temporarily adapt the Weesperpoort to eleotr.ic traction. and as a consequence of this, the aspect of this old station is now ruined by the erection of poles for the overhead wires, and th is will ·be the last stage in the life of this historic building before its demolition. In connection with your recent account of the railway section of nhe Paris International Exhibition I should like to be allowed to add mention of the amcndtics that were offered to visitors by the five main line French railway companies, viz., the Nor d, Est, P.L.M., Etat and P.O. I refer to the permits that were issued to applicants at the office in the section, enabling the public to visit Important centres of railway operation and engineering interest in and around Paris. The printed leaflet gave a list of seventeen places open for inspection on different days and at stipulated hours, the permit for anyone costing no more than a franc which included transport in some cases when the venue was out of t he town. Among the installations to be seen were workshops, shunting yards, statistical machines, central train control office, locomotive testing station at Vitry, autorail depots and transformer stations. To have provided such varied and valuable facilities is I think, worthy of acknowledgment to the enterprise of the railways concerned. The new edition of this useful reference book for engineers contains the usual tables for workshop and general use as well as mathematical tables. Sections on toothed gearing, compressors, pumps, internal combustion engines and fuels, machine tools, steam boilers, superheating, fuel economisers, steam turbines, pipe work, press work, etc., will give some idea of the wide range of subjects included. Electric arc welding has developed to the stage where the details of application and the user's point of view are important. Therefore the new section on this subject is most opportune. Besides explaining details of the process, the types and properties of electrodes are described, and directions for various methods of welding. The Manewood Line. James Kenward, 350 pp. London: Stanley Paul and Co. Ltd. Die entwicklung der lokomotive II Band (The development of the locomotive, Volume 2) .Reichsbahnzentralarnt Berlin, and Baurat Dr. Ing. Metzelin. Published by R. Oldenbourg, Munchen and Berlin. This volume, in two parts, is published under the auspices of the Verein Mitteleuropaisher Eisenbahnverwaltungen, and deals with the progress of locomotive design between the years 1880 and 1920. Volume 1 covered from 1835, the opening of the first Central European Rly. (Nuremburg-Furth) until 1880. The present Band II includes two books, the text book containing 495 pp. and 492 illustrations, whilst .the "table and drawing" book includes 34 pages, with dimensions of every type of engine built for the railways covered between the years noted, accompanied by 28 folded drawings of selected engines. The whole work is typical German in its mericulous production, and provides a complete review of the steam Iocomotive of the last years of the 19th century and the first two decades of the 20th century, on the railways of the various State, of Germany, with certain "Iocalbahn," i ogcther with the lines of Austria-Hungary and Holland. 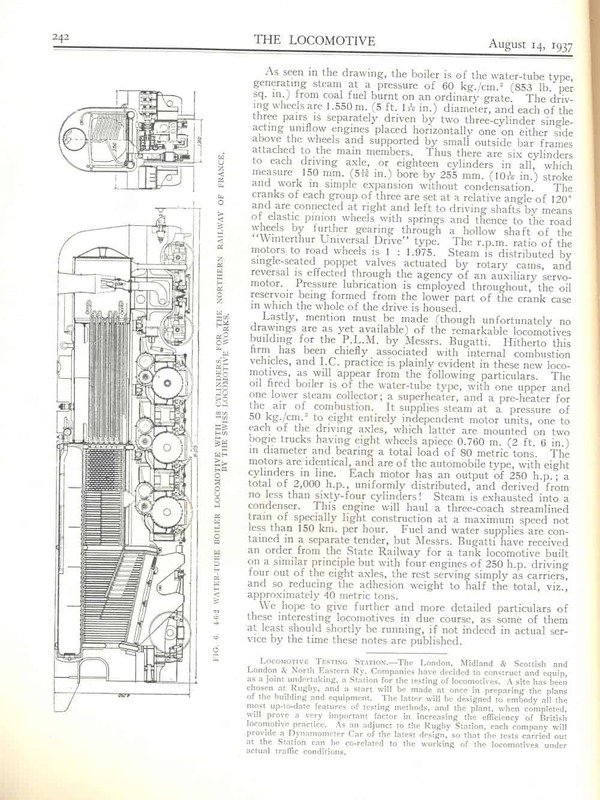 In the "text" volume, line drawings and photographs are given of some 400 locomotives, supplemented by chapters on tenders, narrow-gauge engines, and rack engines. A short section at the end of this book refers to changes in the quality and nature of materials employed over the period, with some drawings of details of special interest, such as the Brotan boiler of the Hungarian Railways, and the engine-to-tender couplings of the Oldenburg Railways. Taking some information at random, it is interesting to note that the 2-B-1 type of the Baden Railways, built in 1902 to 1905, attained a travelling speed of 102 km. per hour (63 m.p.h.) with 300 tons, and a maximum of 120 km. (75 m.p.h.) on the Mannheim-Karlsruhe line, whilst Offenburg to Freiburg, 39 miles, was covered ,in 33.5 minutes. The highest .speed recorded of these engines was 89 m.p.h. The regular daily service was Mannheim or Heidelberg to Basle, and return. about 630 miles. The general information in the book is interestingly parallel to ·that given in Ahrons' "The British Steam Loco- motivc," and accordingly should be of corresponding value to students of European locomotive development. The thoroughness of the supplementing book of tables and drawings is best indicated by a .reference to, say, the section on Austria, which covers 121 different engines, with particulars of the type, boilers, designed speeds, weights, boiler dimensions, valve gear, etc. The books are produced in the usual high style of the German technical printing art, and are entirely deserving of a position in all engineering and transport libraries, as, to the intelligent railway engineer, drawings and tables are themselves an international language, so- that the fact that the printed language is not English should' be no great check on being able to obtain any essential. information.